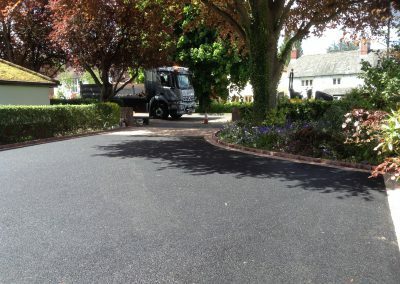 ■ If you want to find out more about Tarmac and Asphalt and it suitability for your driveway, click here. 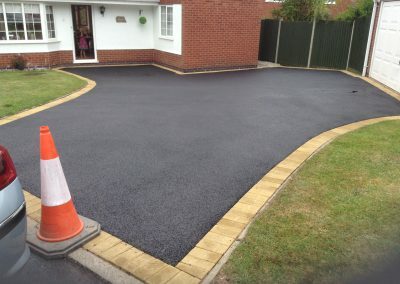 Tarmac is a particular brand of Asphalt. 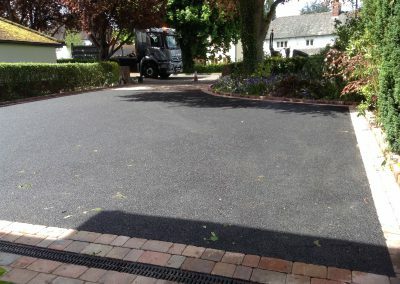 In today’s construction industry we also have brands such as Hanson Asphalt that either use Tar or Bitumen in the contents. Over the years the Tarmac brand has become such a common household name, that few know it’s name by any other means. 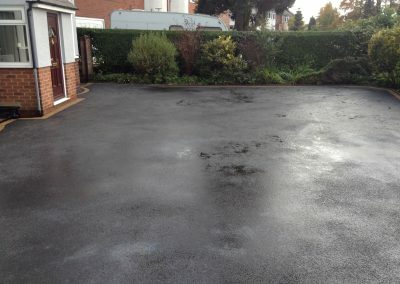 We all refer to it as Tarmac, but actually we mean Asphalt. 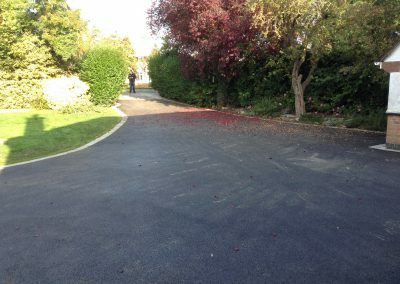 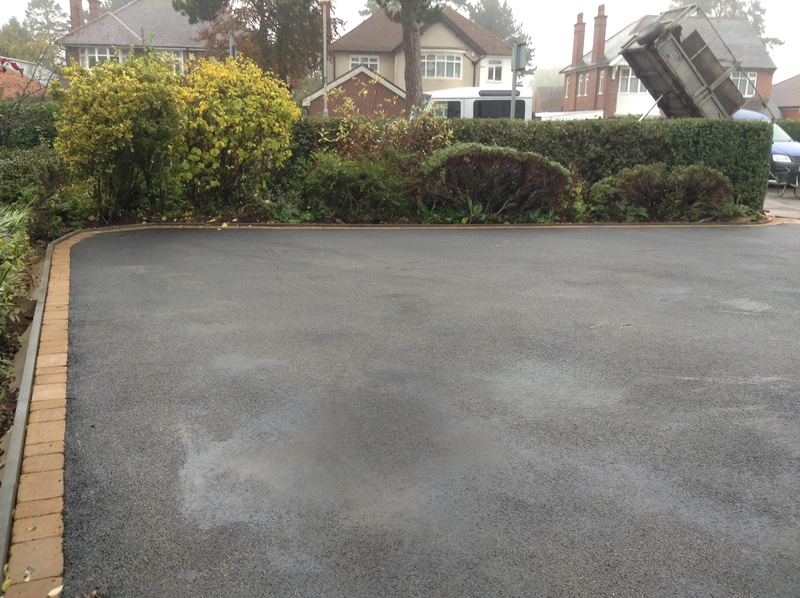 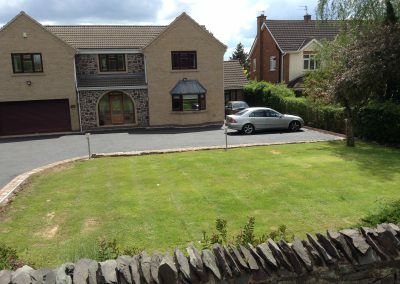 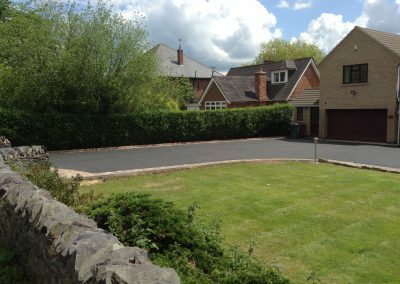 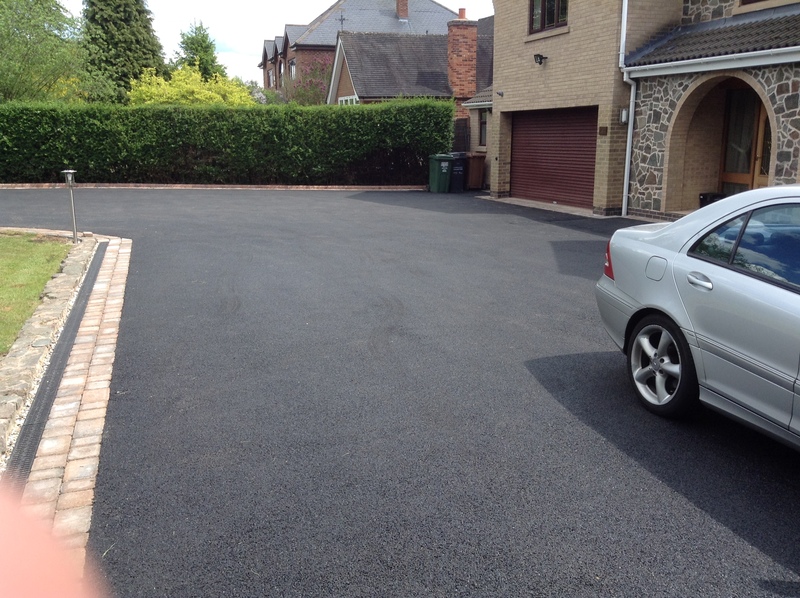 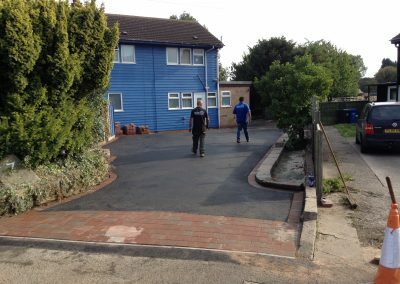 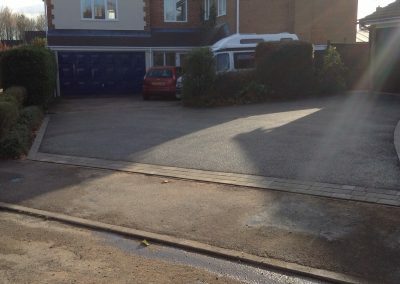 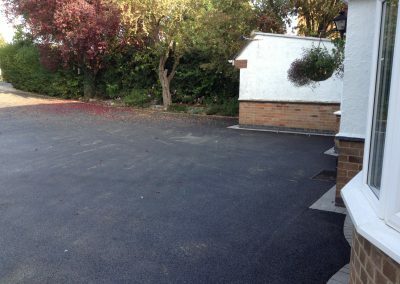 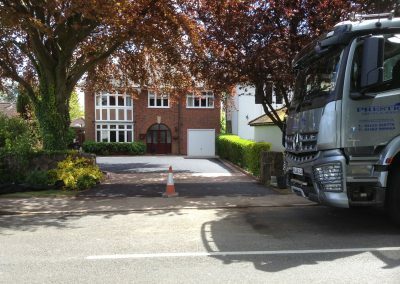 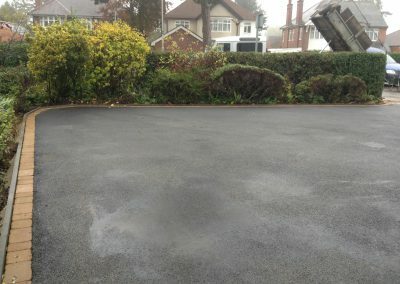 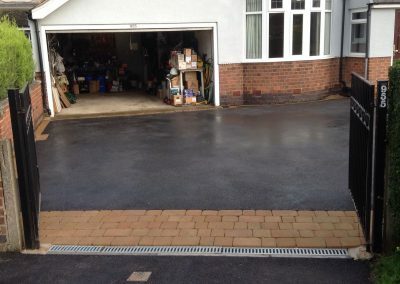 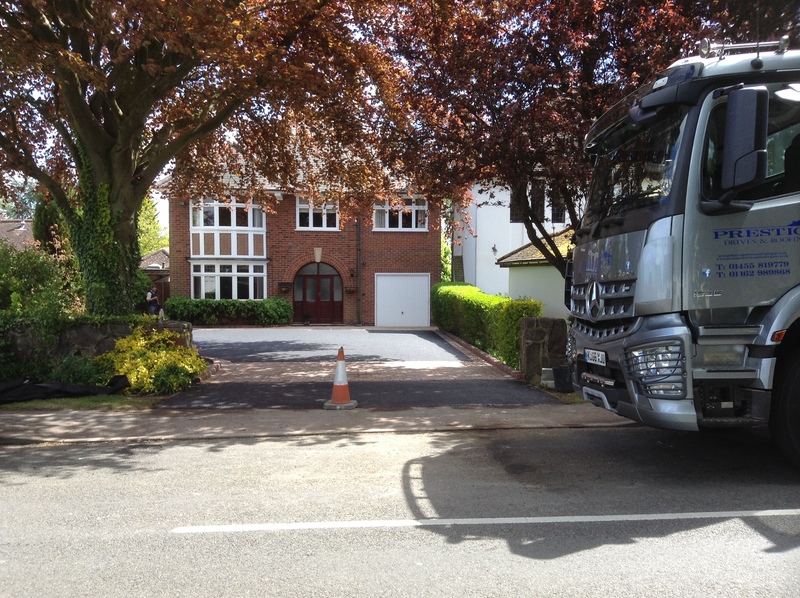 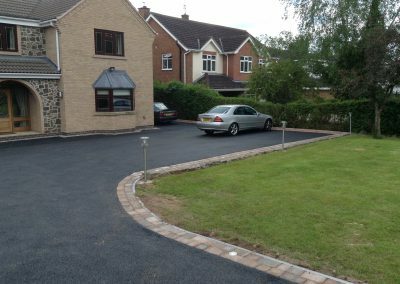 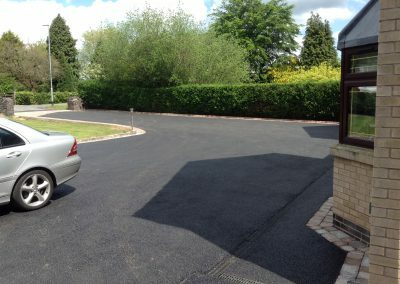 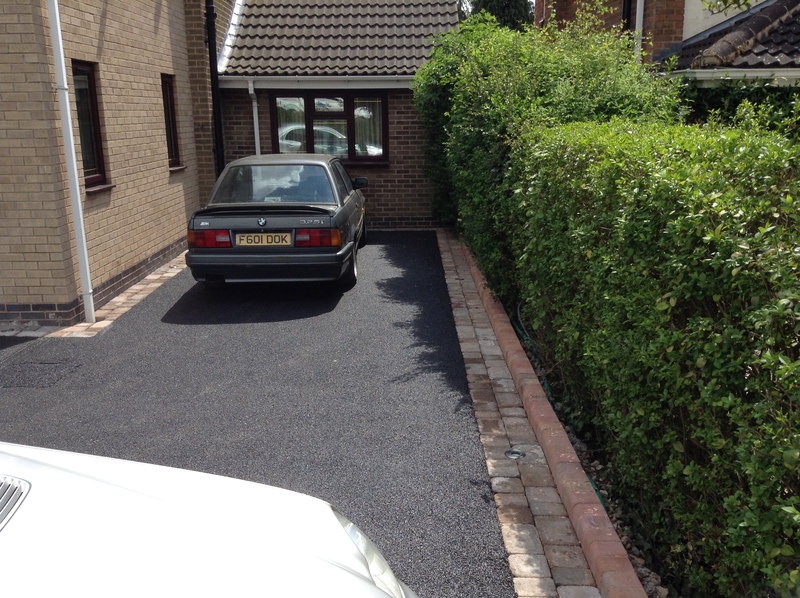 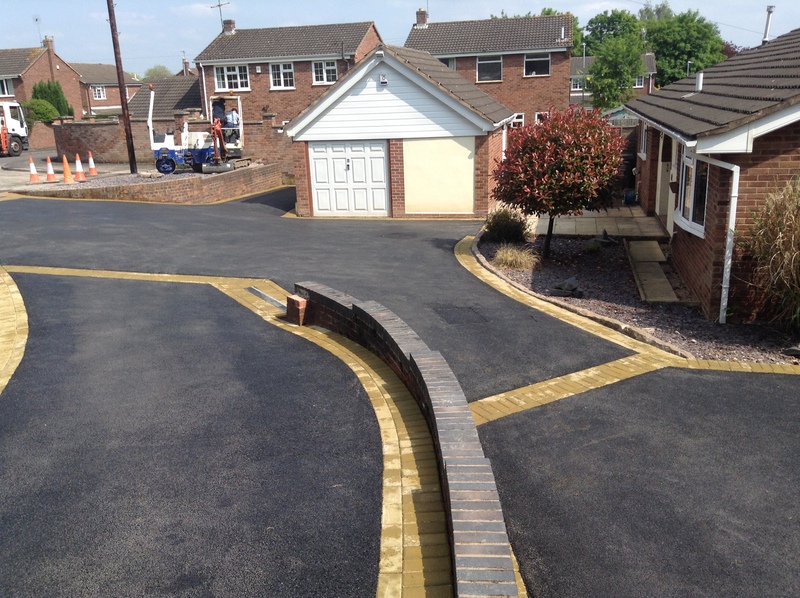 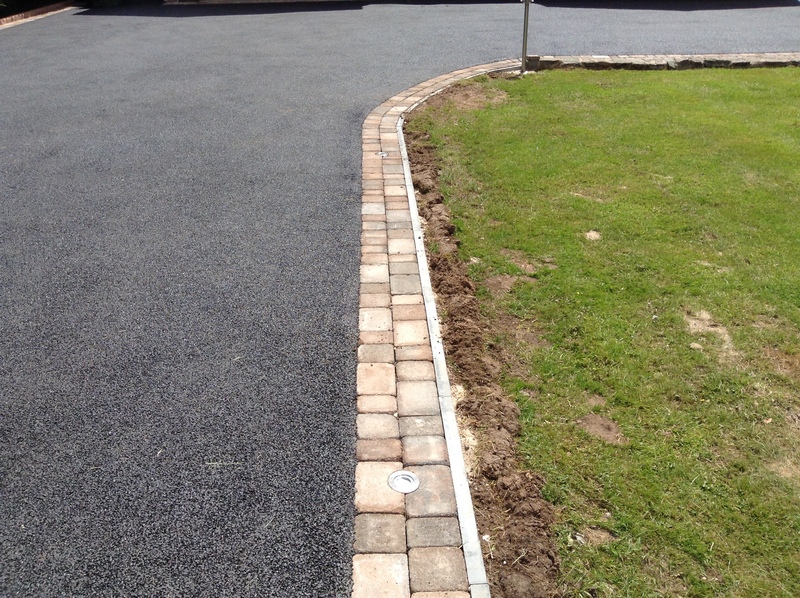 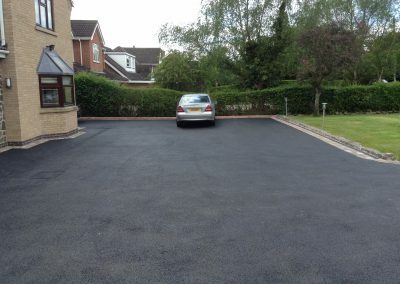 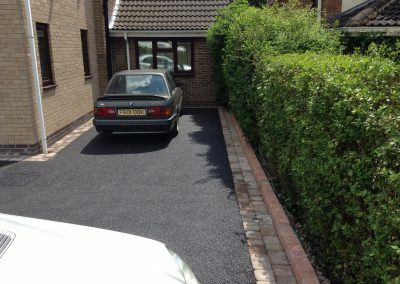 With our tarmac driveways Leicester, we install Stone Mastic Asphalt (SMA), also called stone-matrix asphalt. 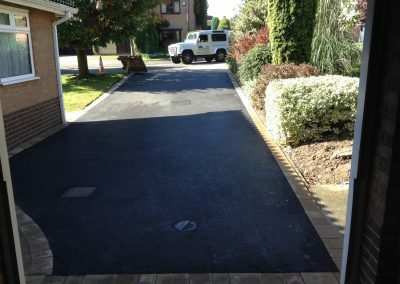 SMA is widely used asphalt where we need a resistant and durable material for heavy traffic roads, so it’s perfect for drives. 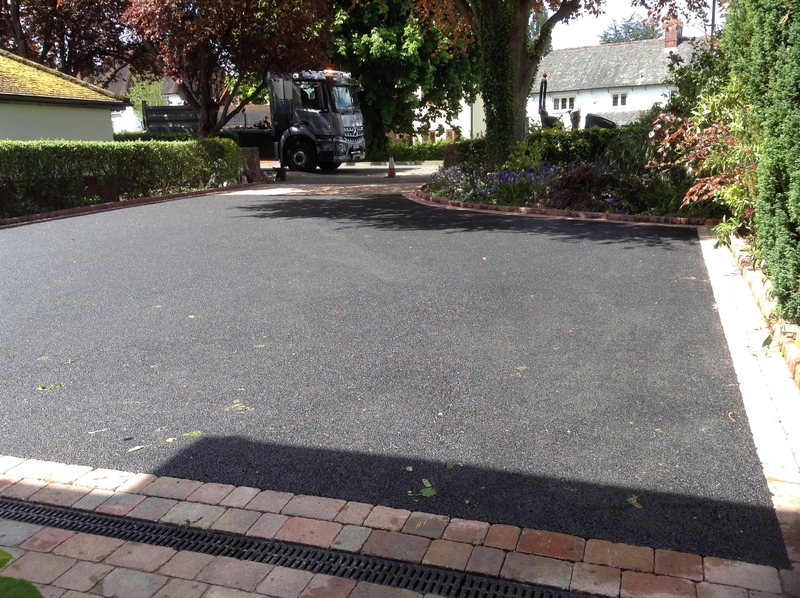 It’s a combination of mastic bitumen, course aggregates, fillers, binding agents and fibre. 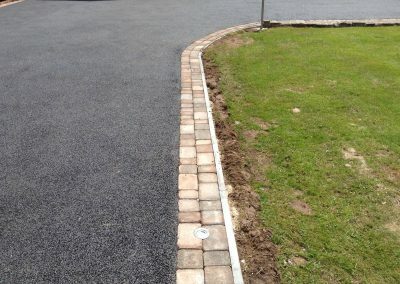 ■ When laid correctly, as we do, it will be puddle free so reduces the likelihood of unnecessary water coming into your house on the bottom of your shoes. 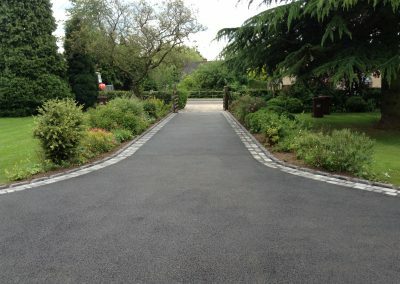 ■ SMA is very family-friendly and is suitable for vehicles, bicycles, karts, pushchairs and all other travel methods. 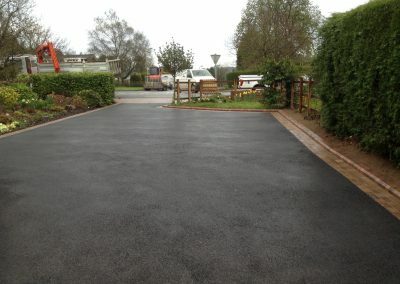 It’s smooth finish means that vehicles can easily move with unnecessary friction. ■ SMA is really easy to keep clean, particularly in autumn and winter months where algae and other bacteria can grow. 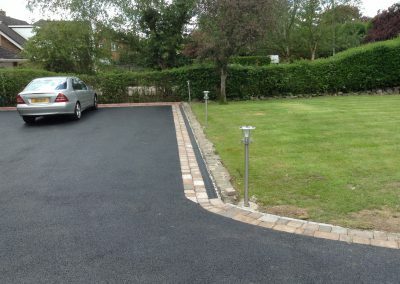 ■ SMA is really long-lasting. 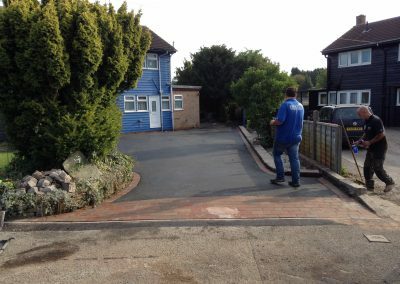 This is very important for our customers because we do not want to be replacing drives too frequently because of the costs involved. 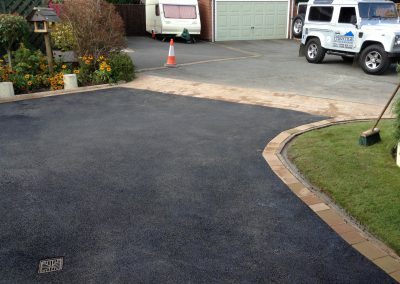 ■ Its hardwearing surface reduces the likelihood of weeds growing. 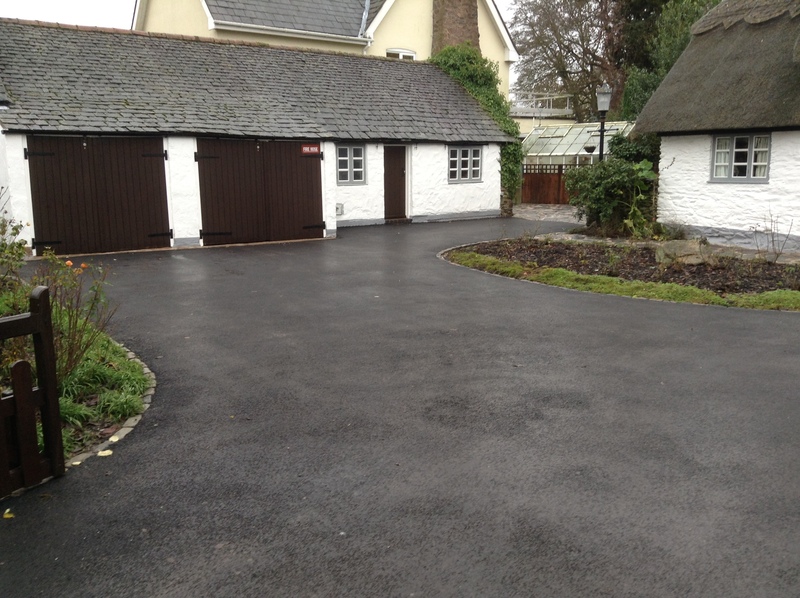 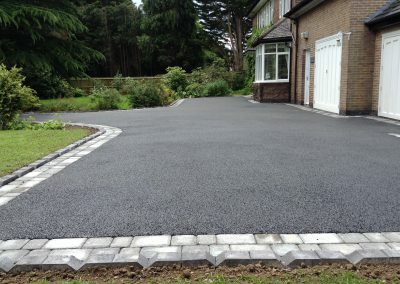 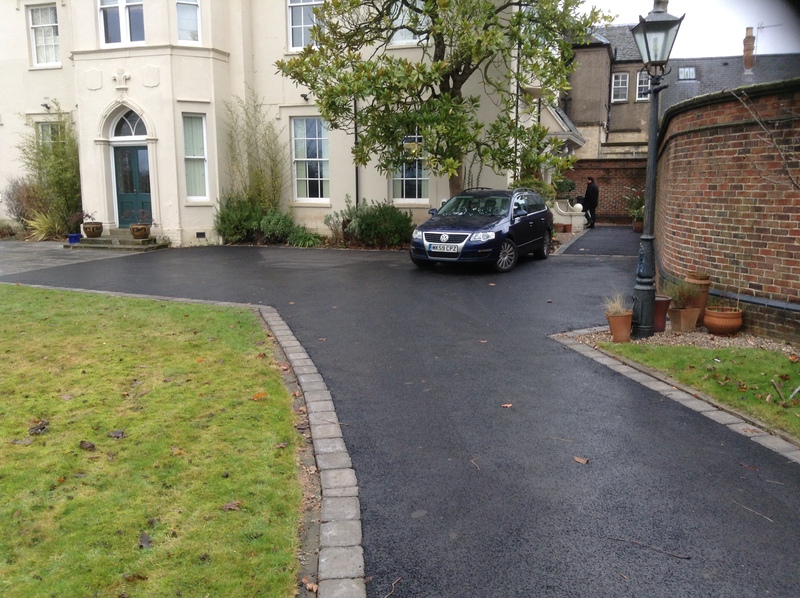 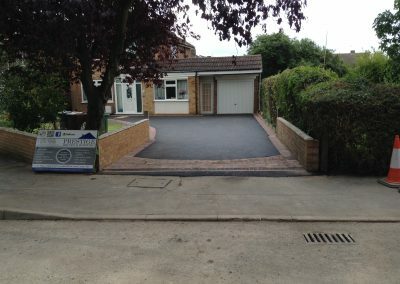 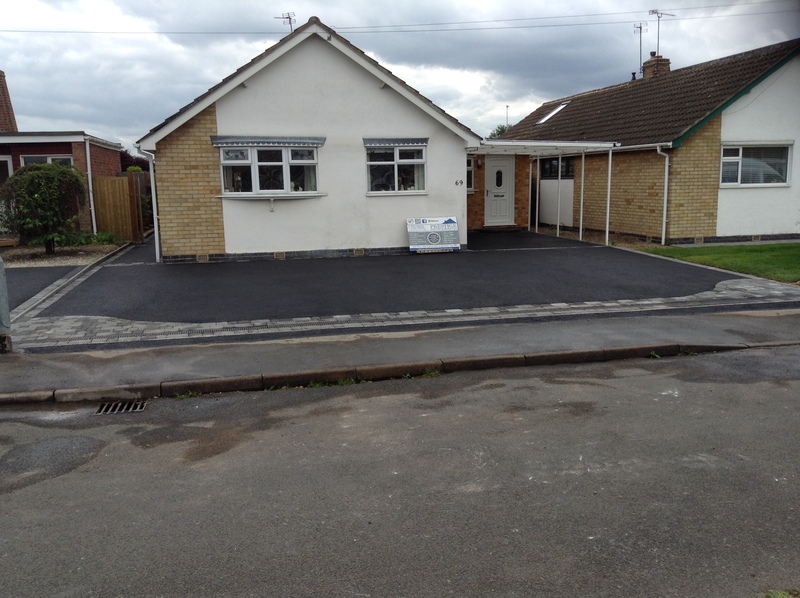 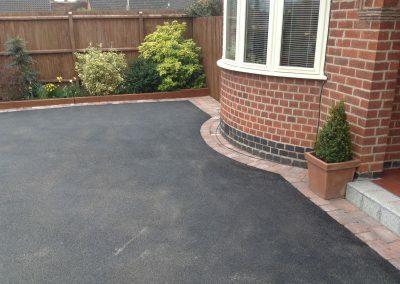 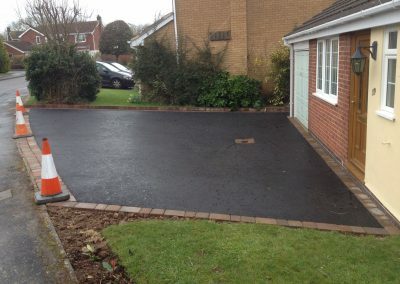 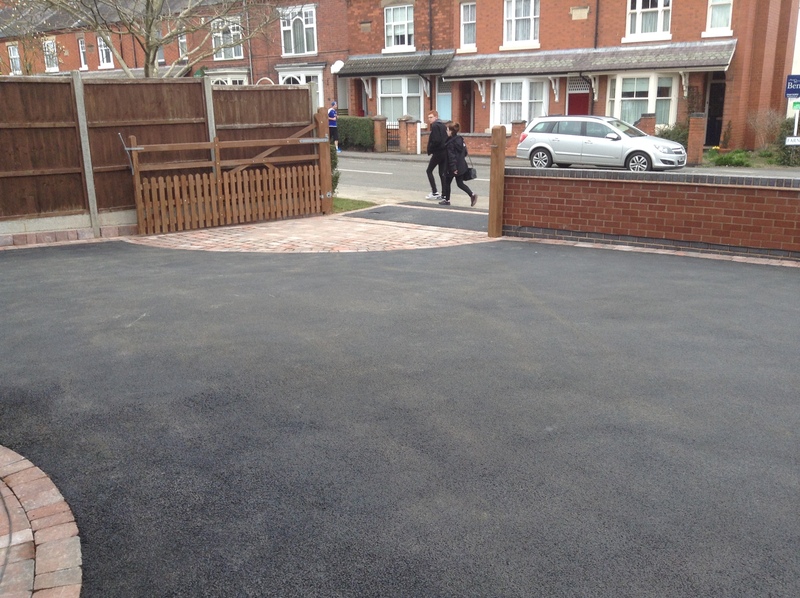 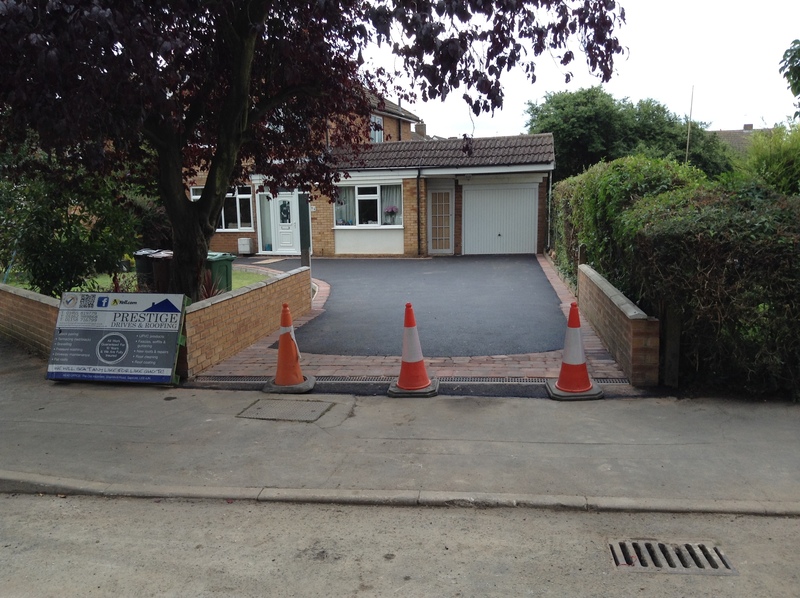 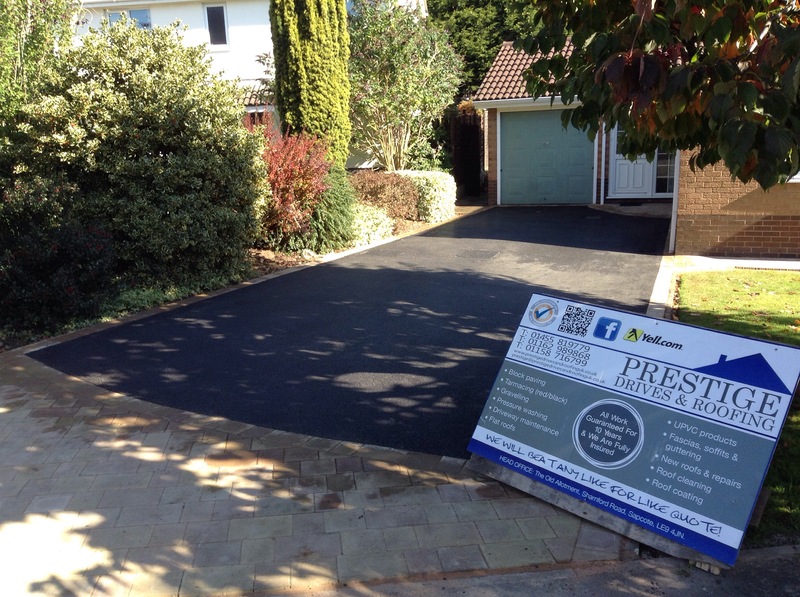 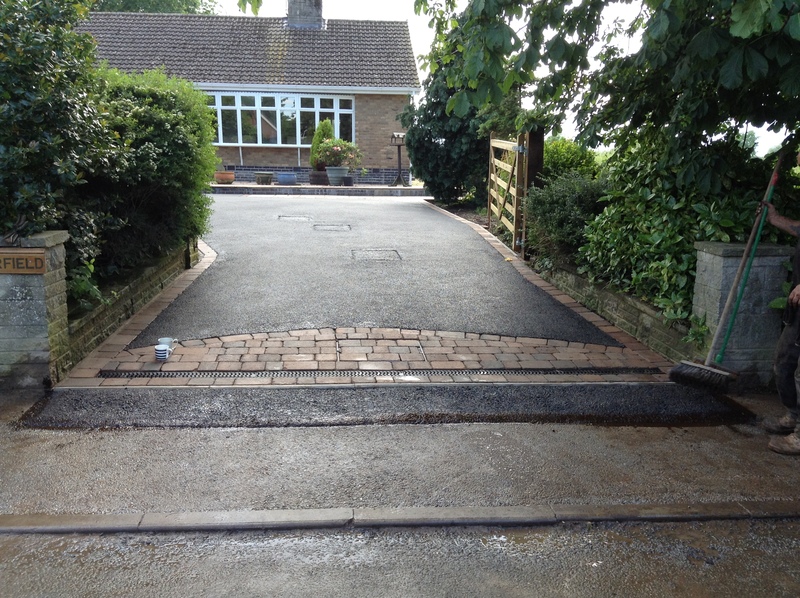 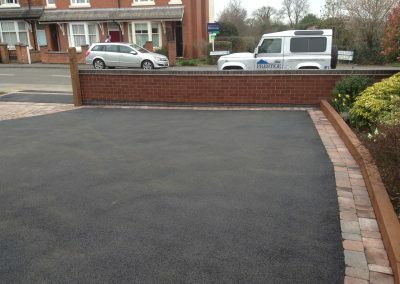 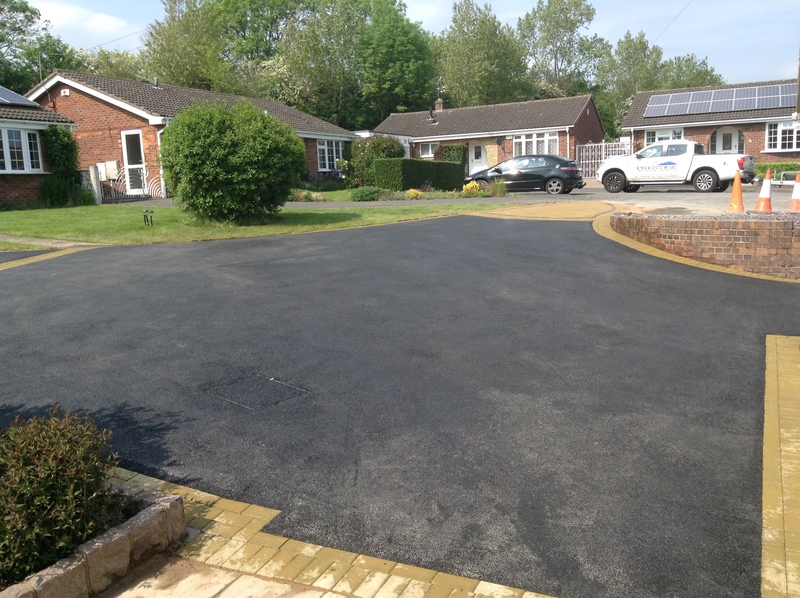 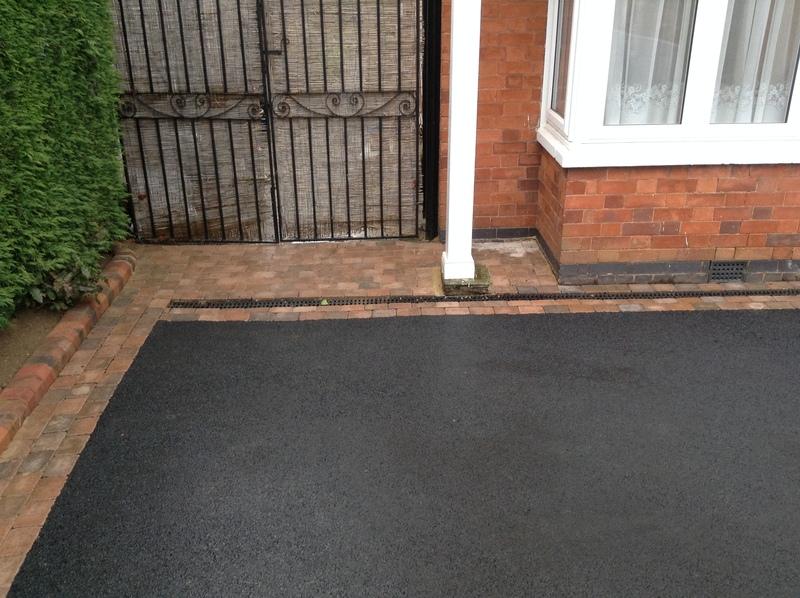 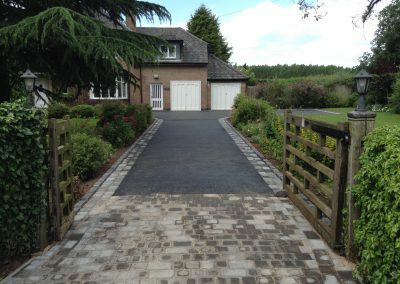 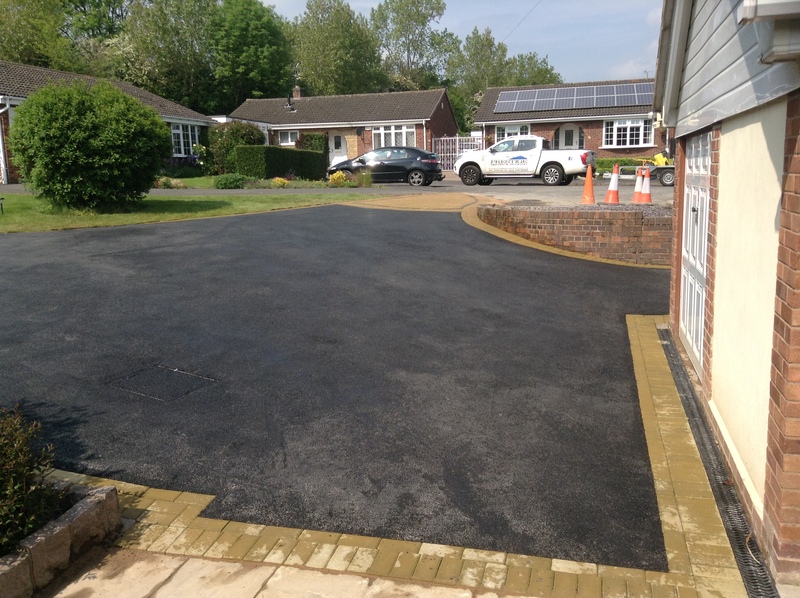 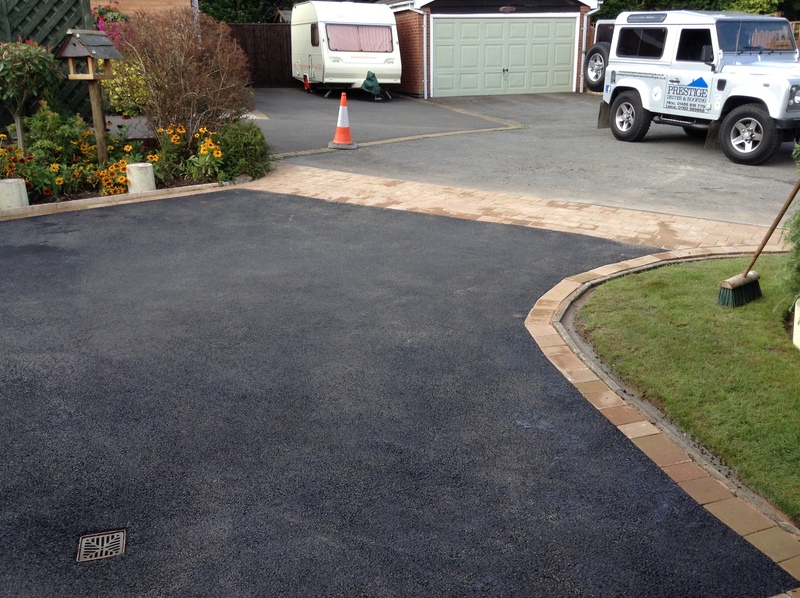 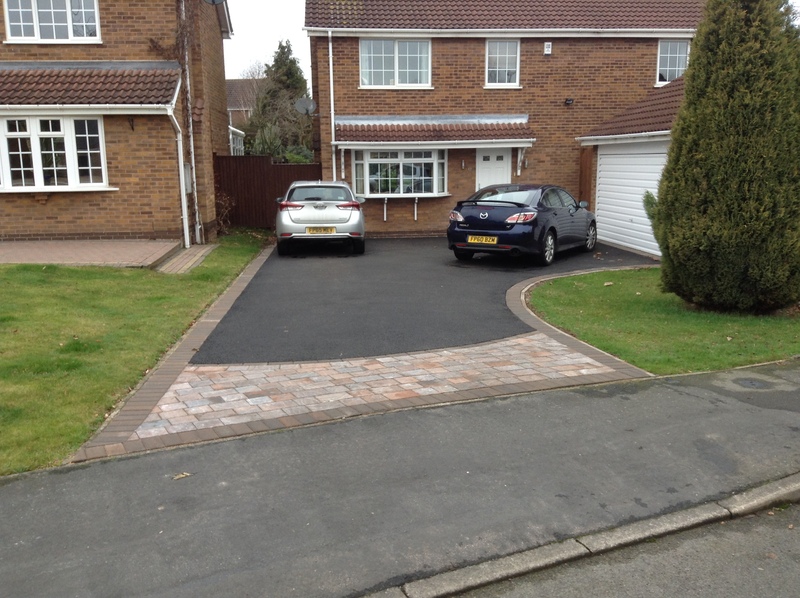 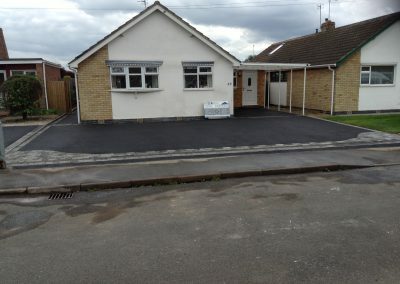 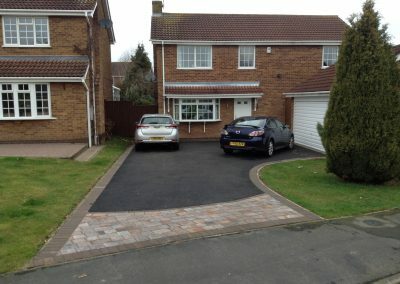 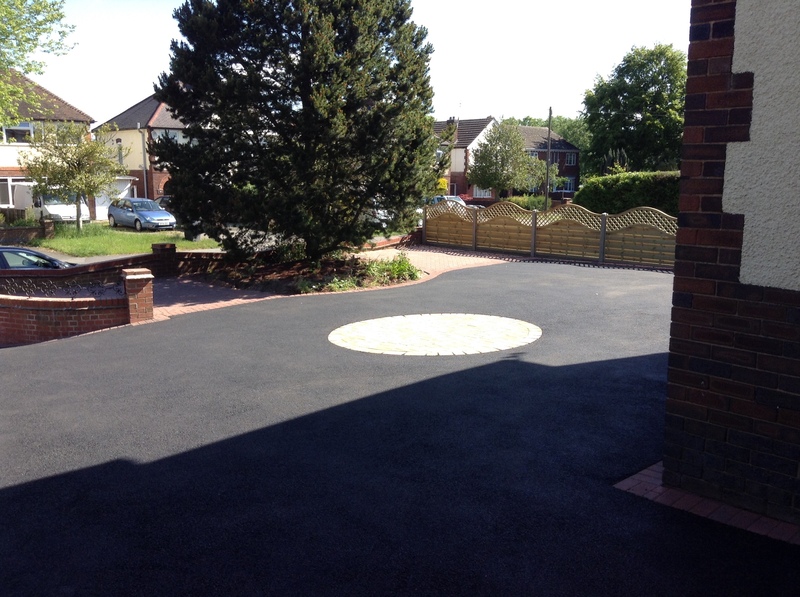 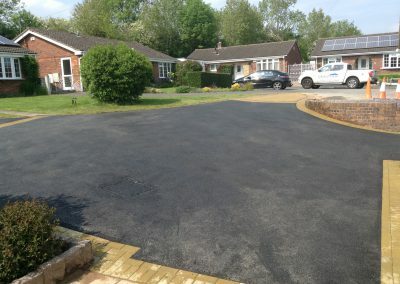 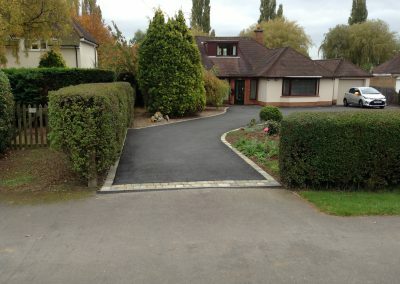 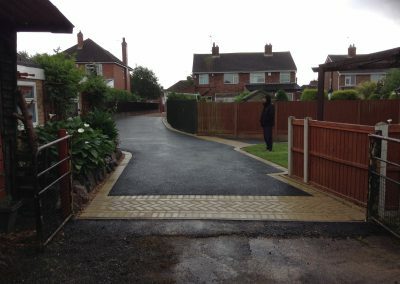 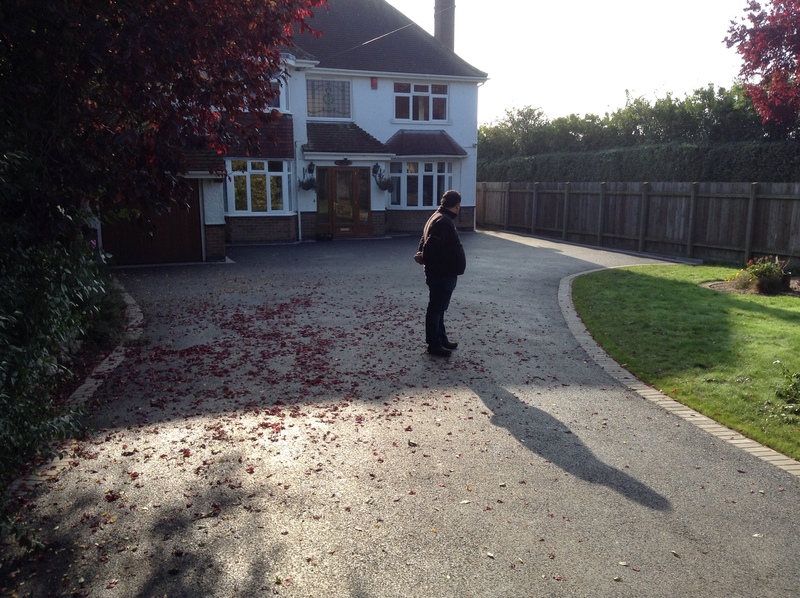 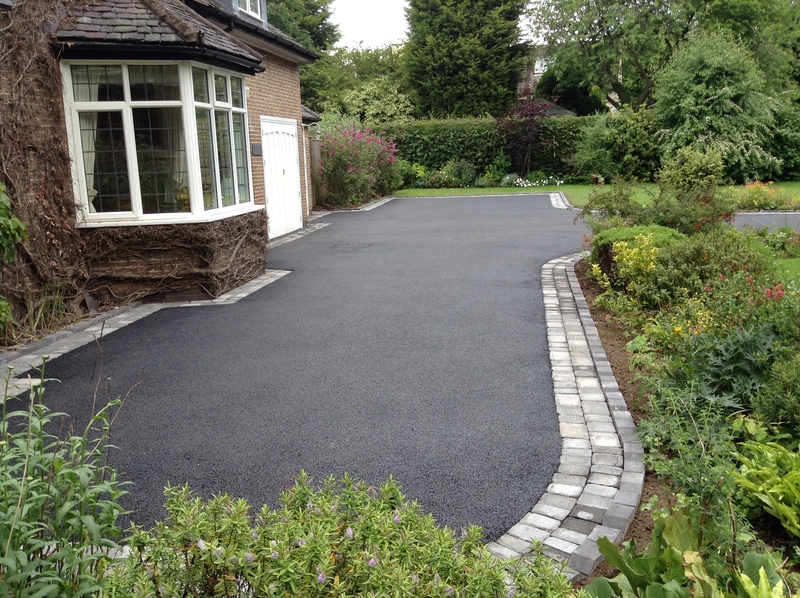 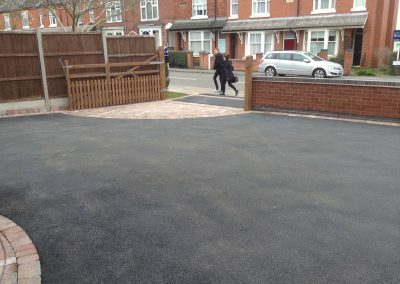 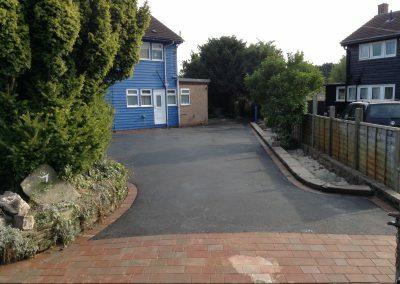 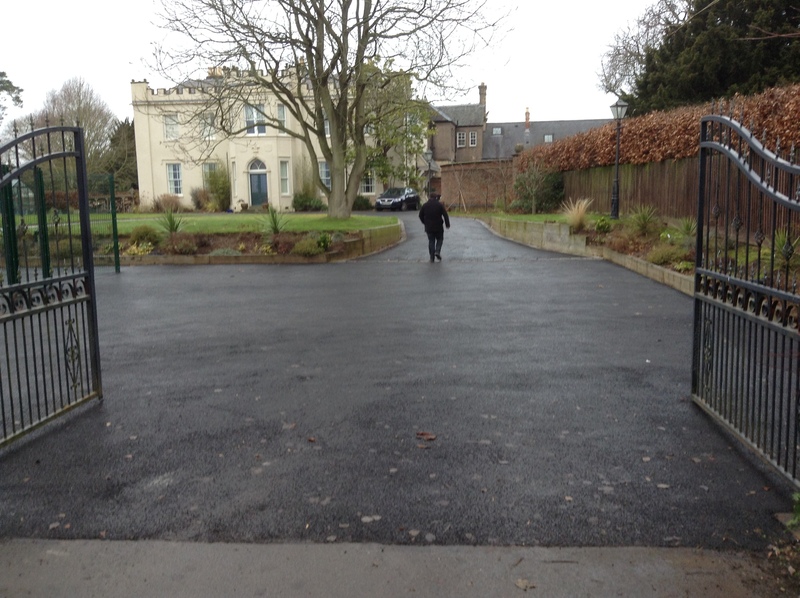 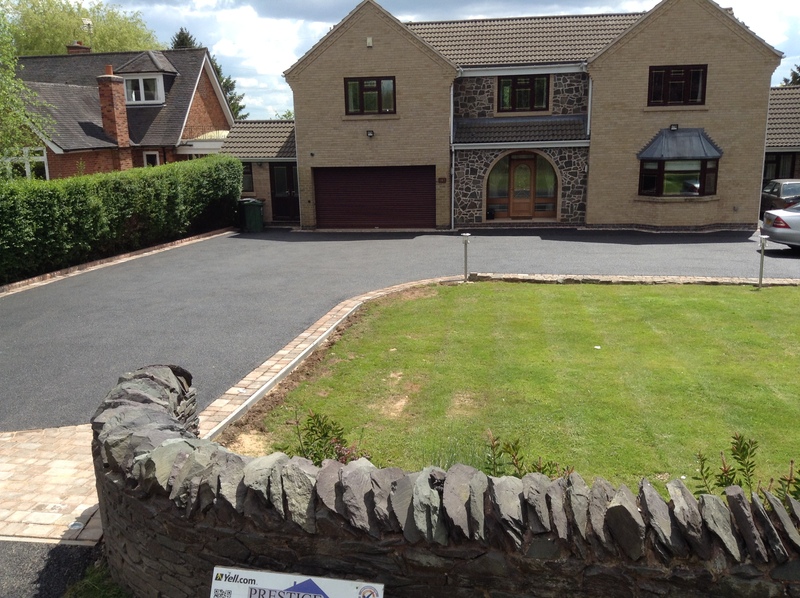 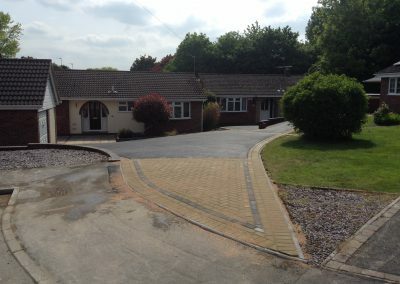 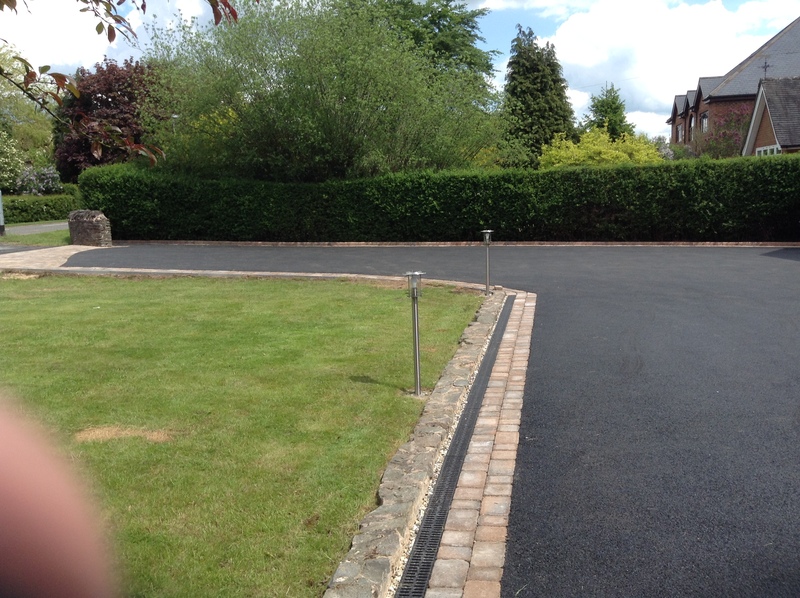 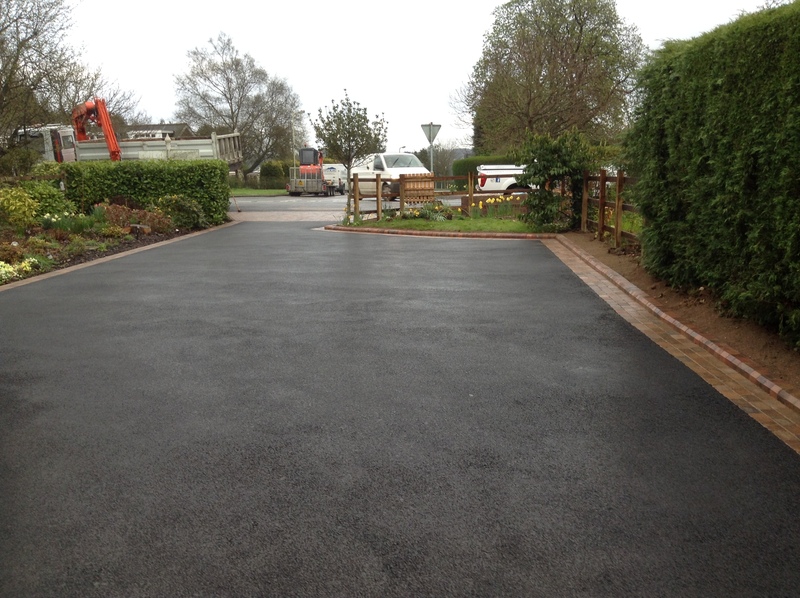 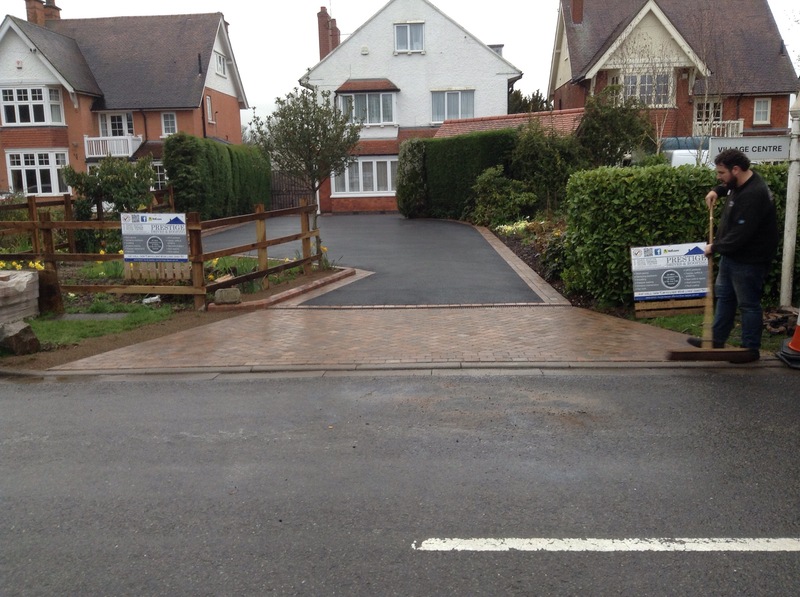 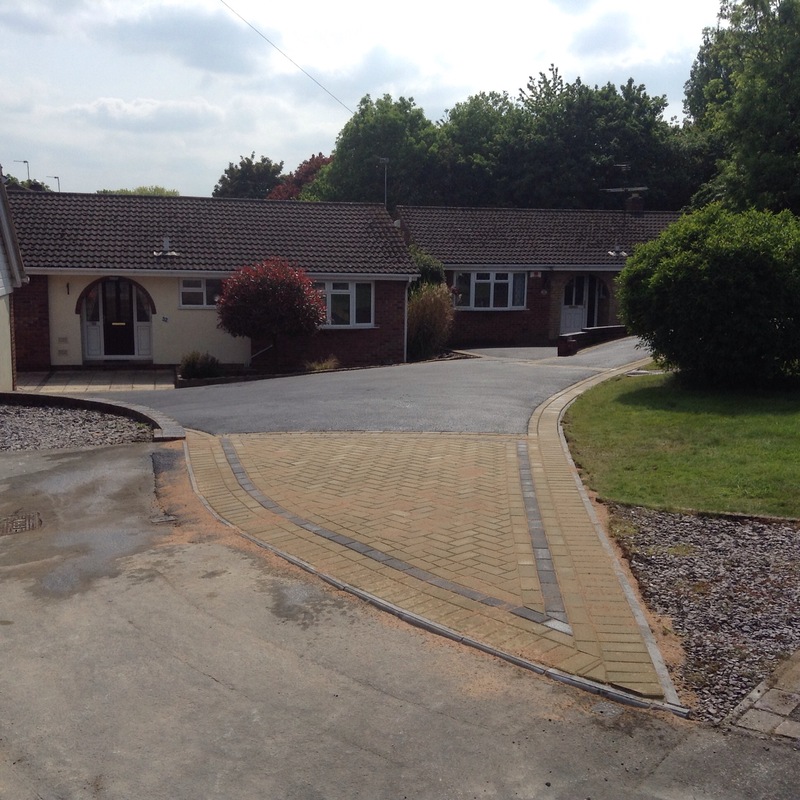 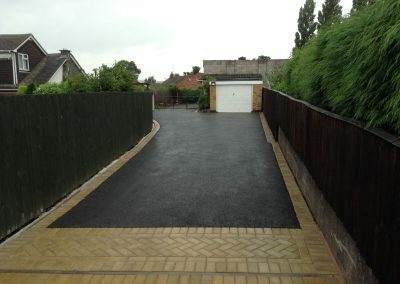 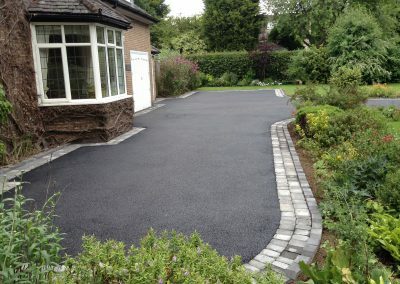 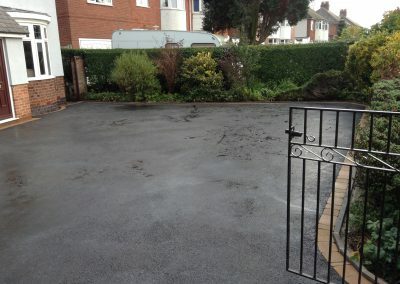 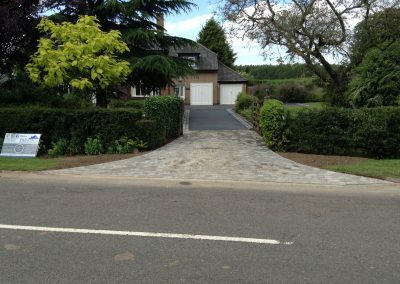 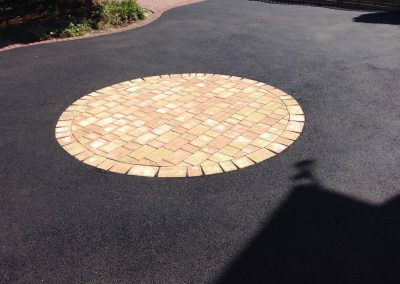 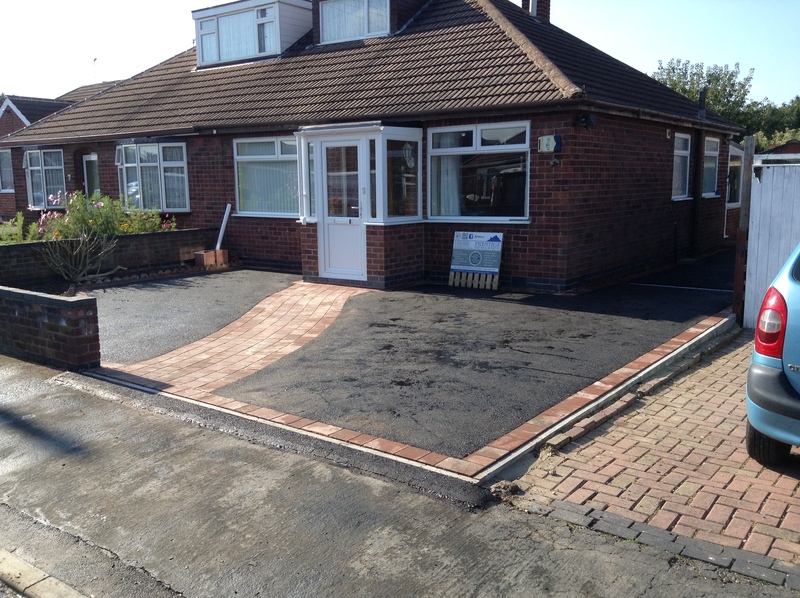 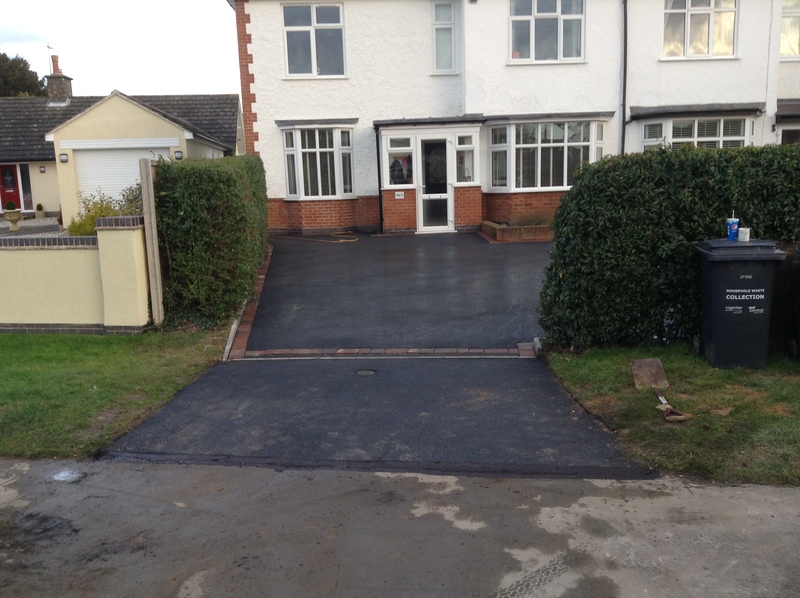 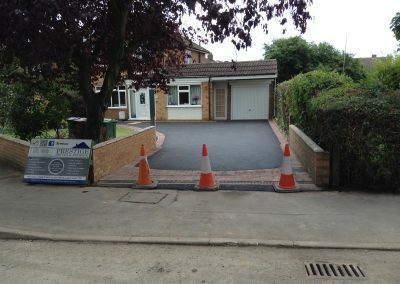 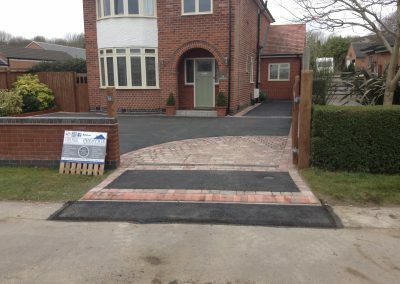 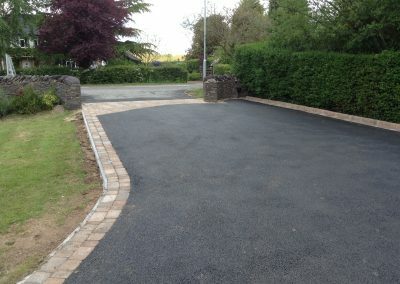 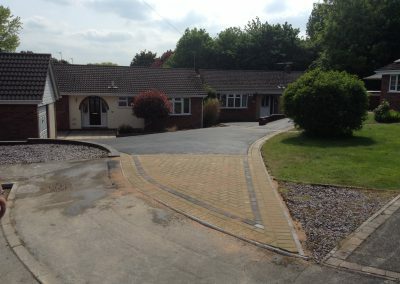 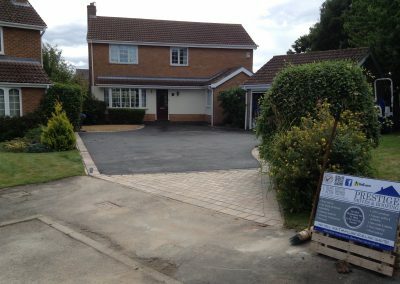 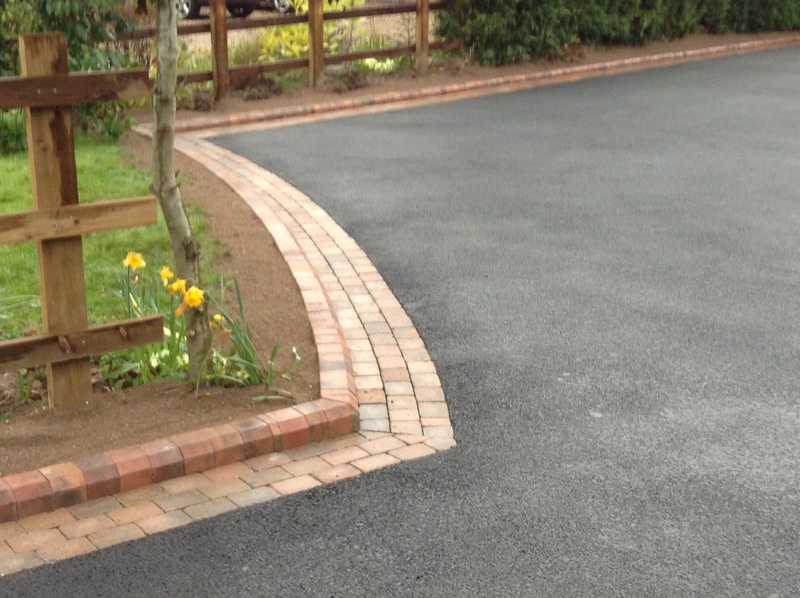 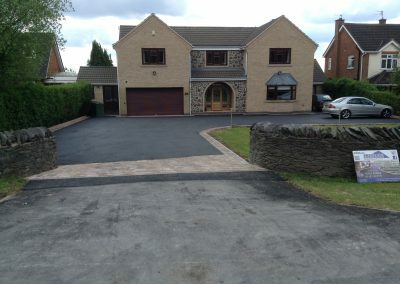 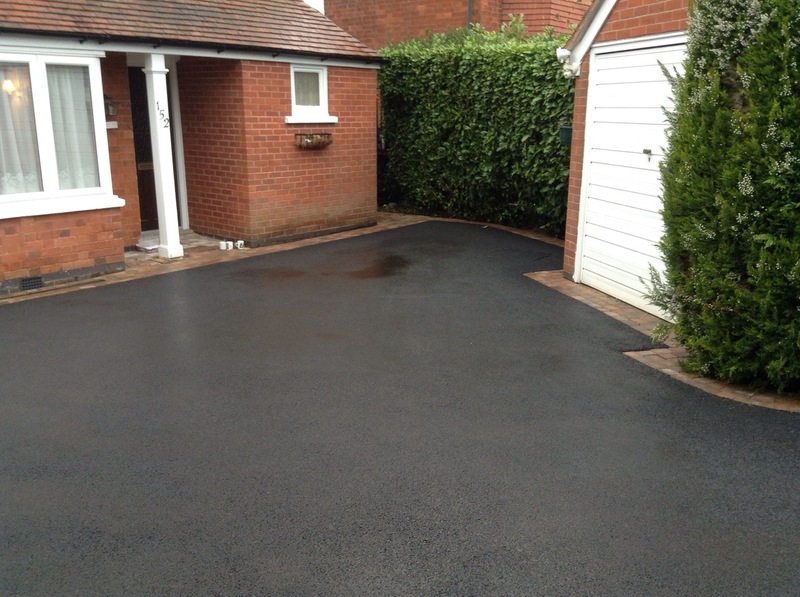 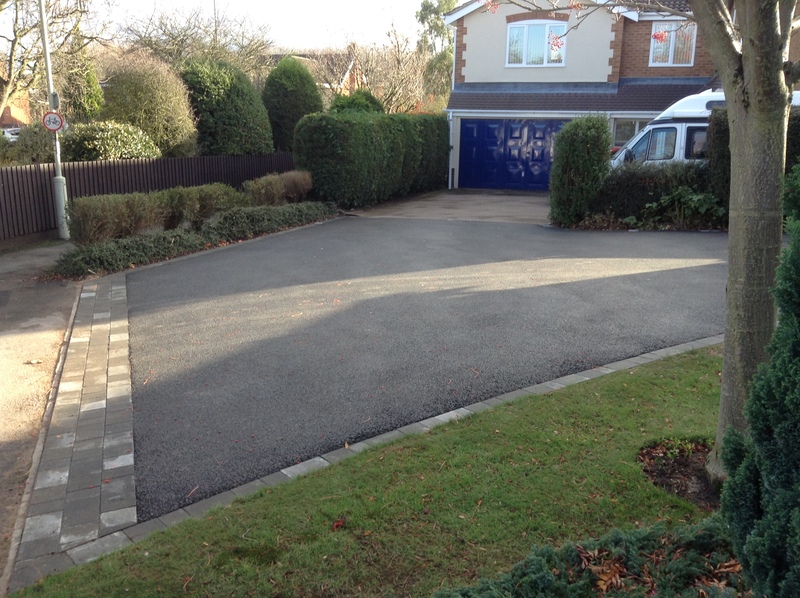 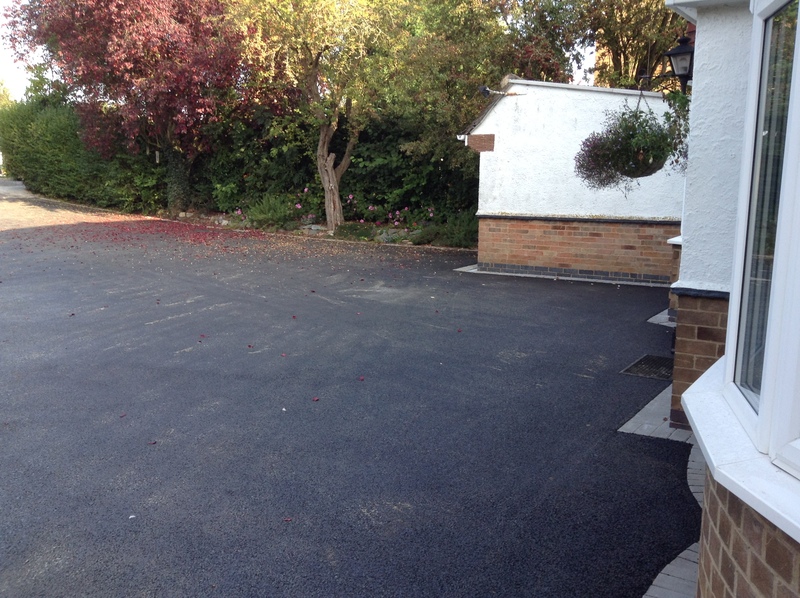 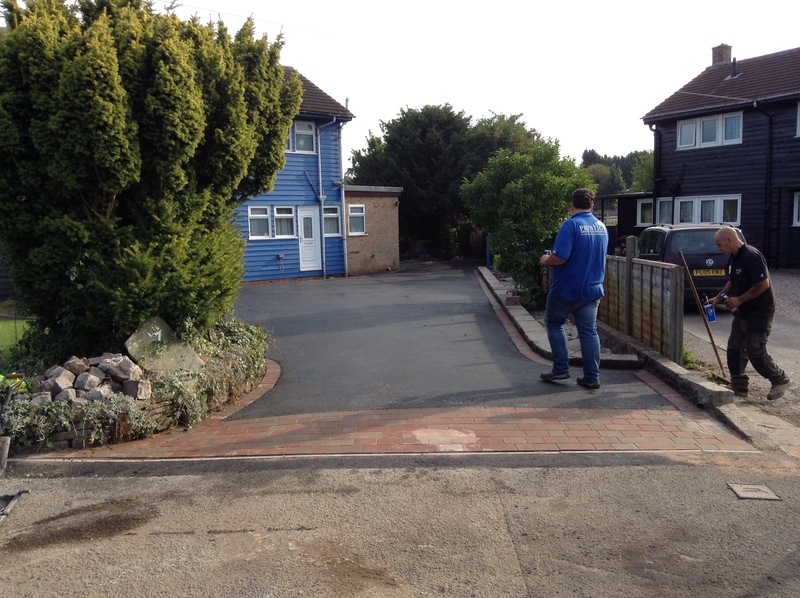 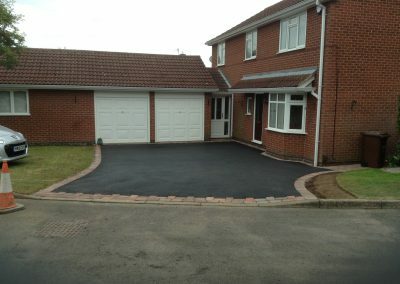 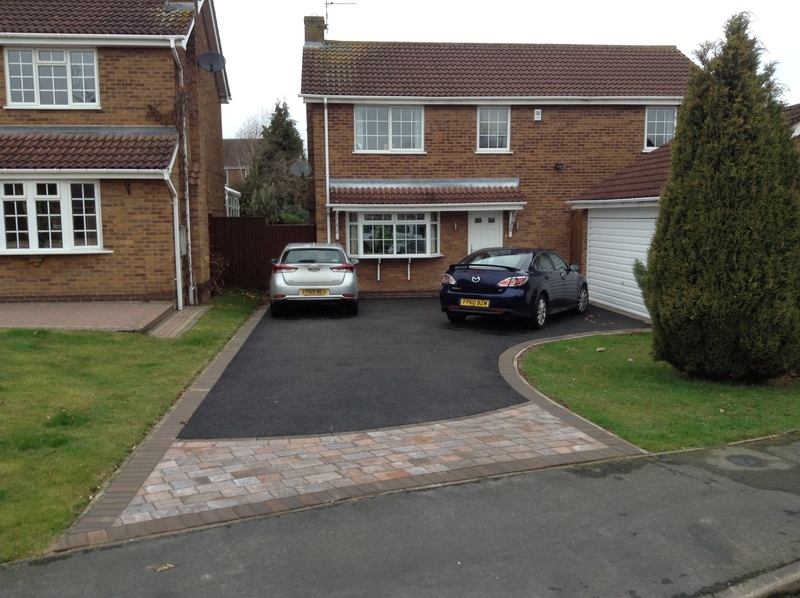 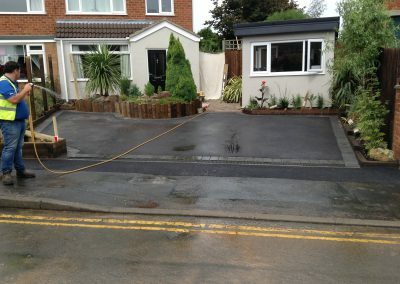 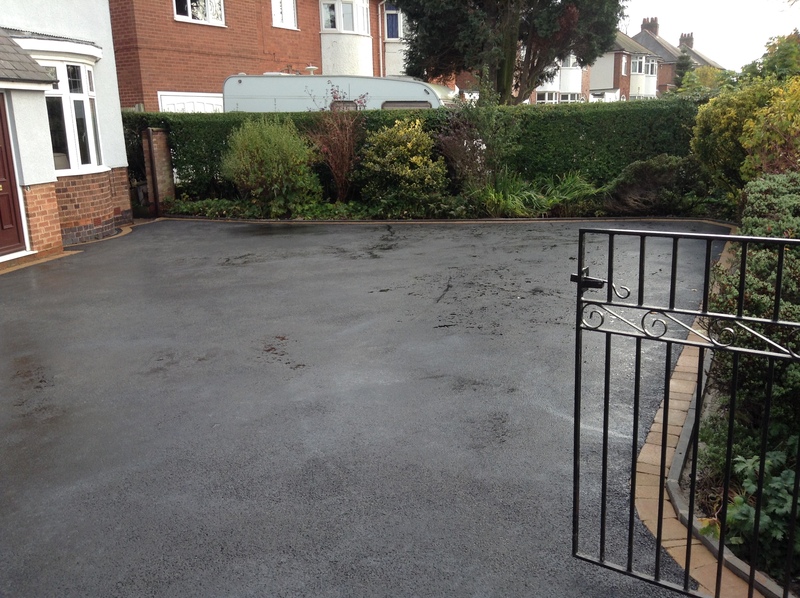 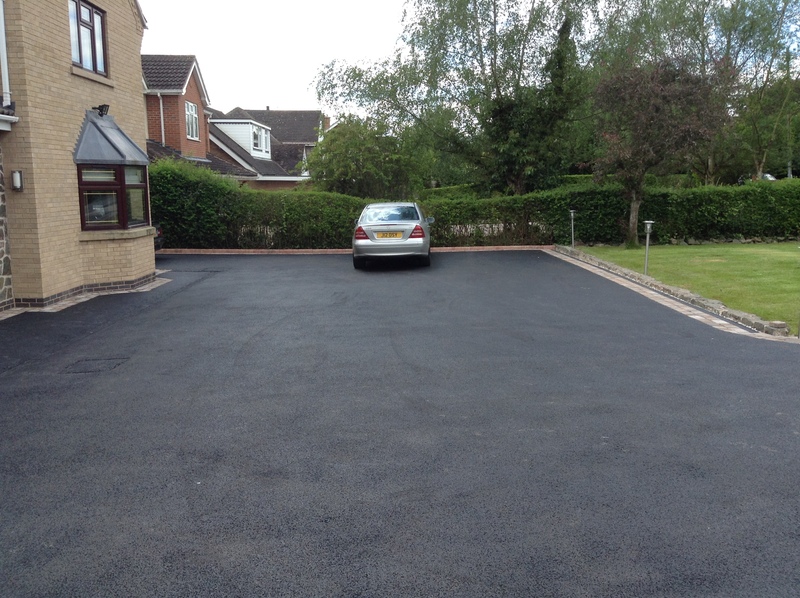 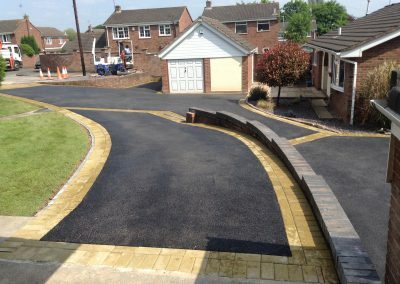 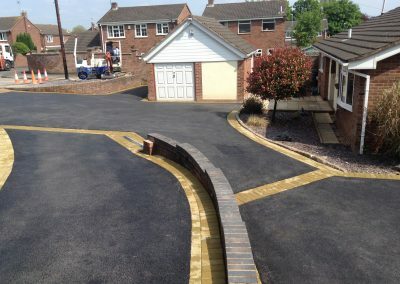 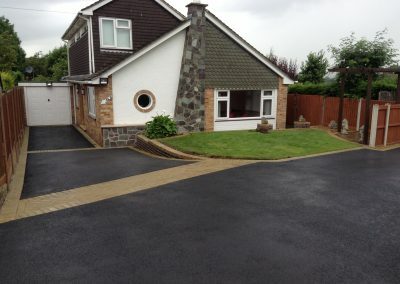 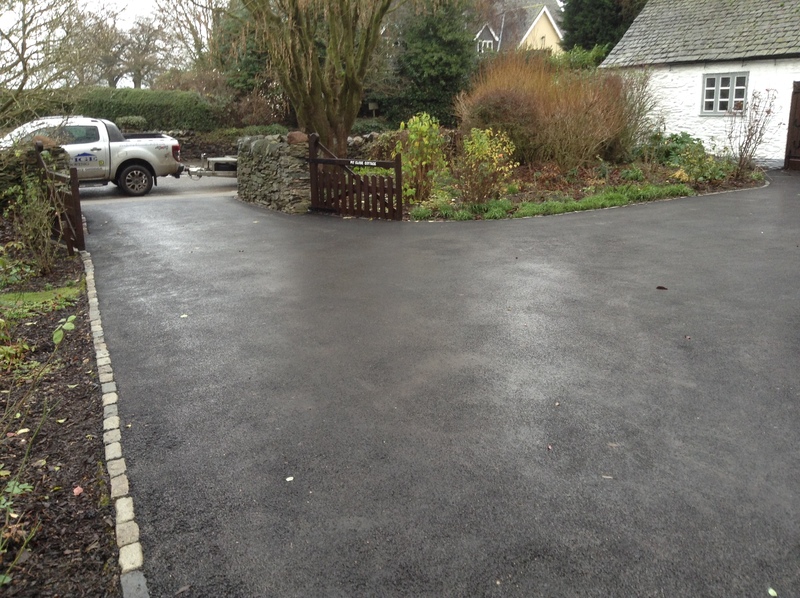 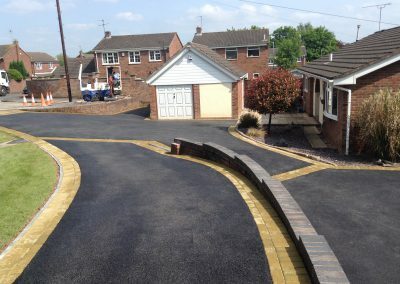 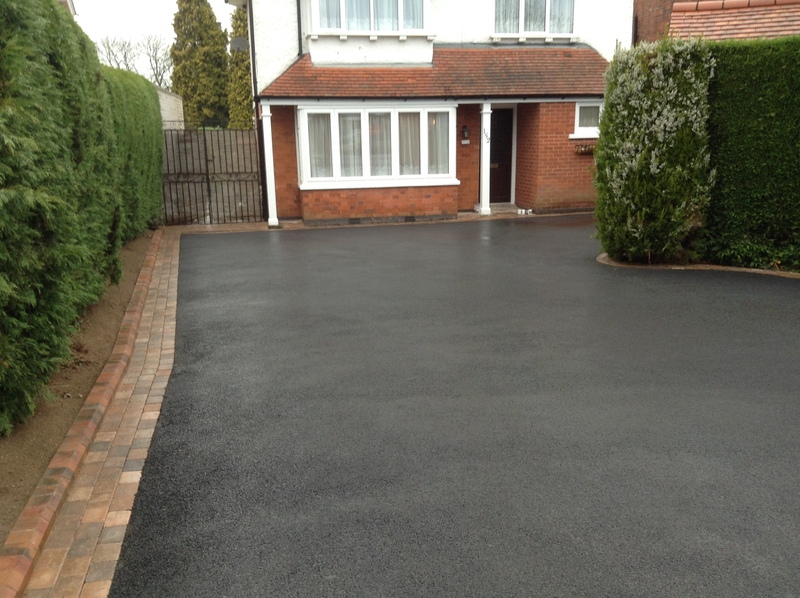 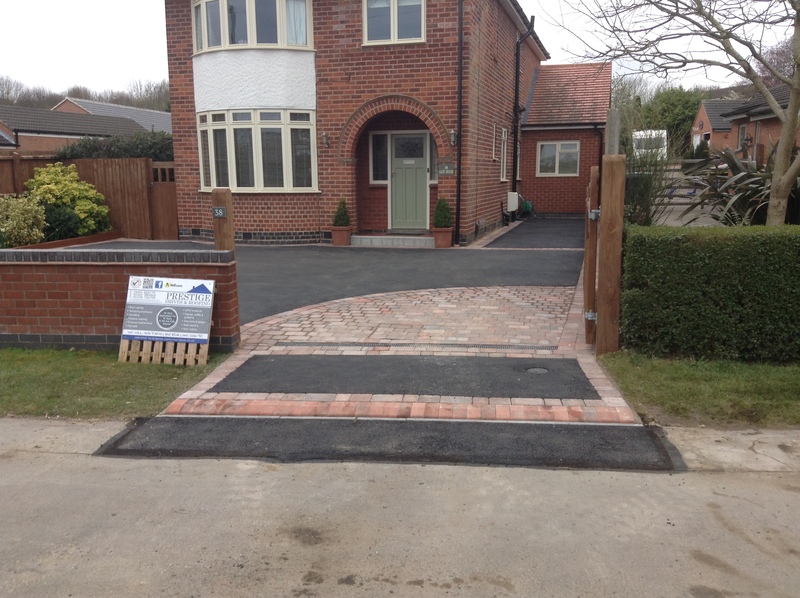 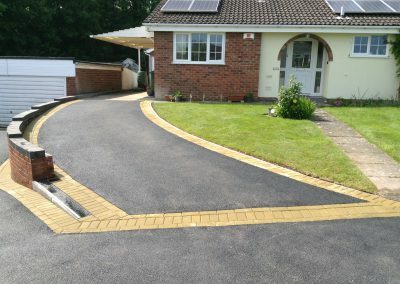 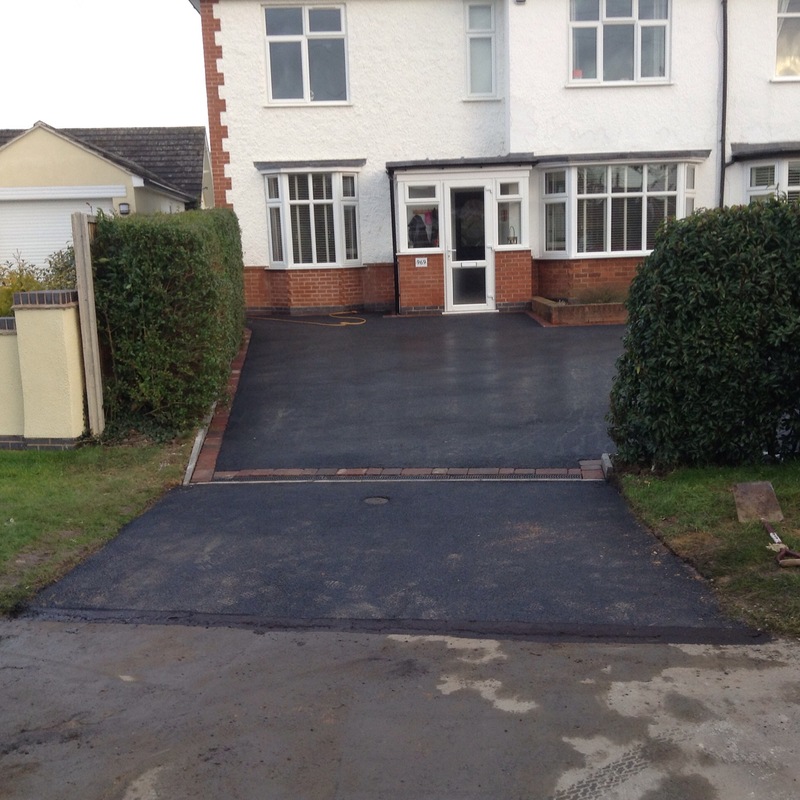 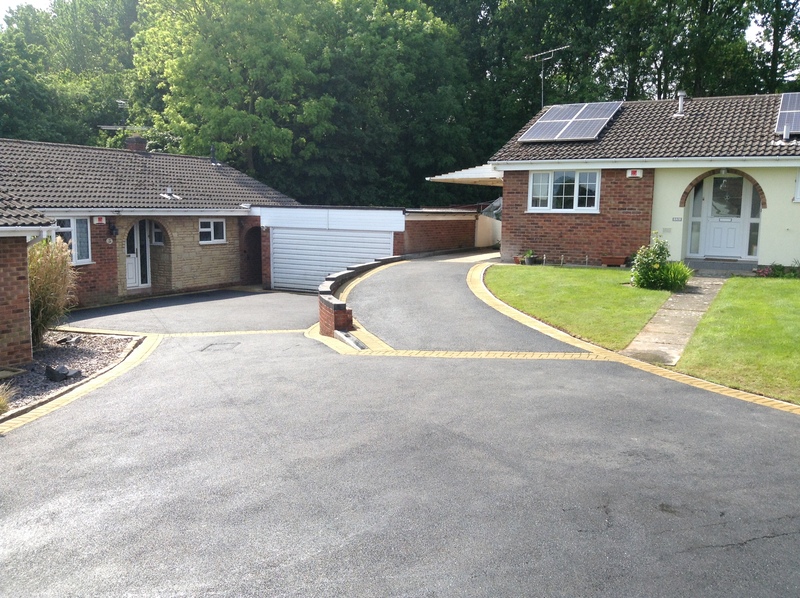 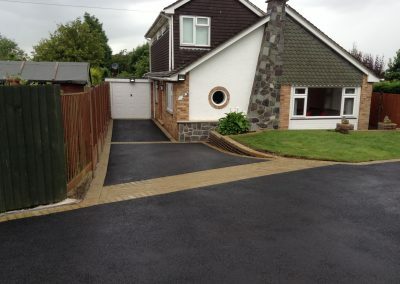 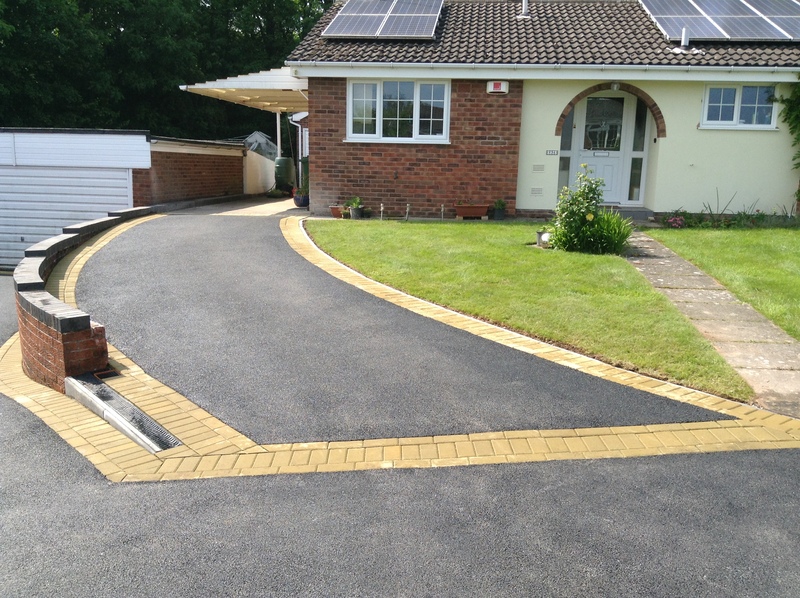 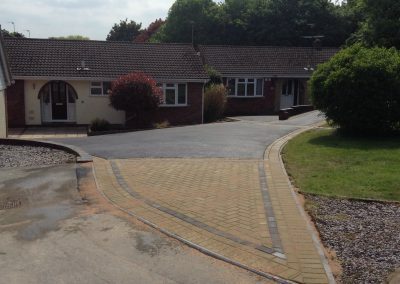 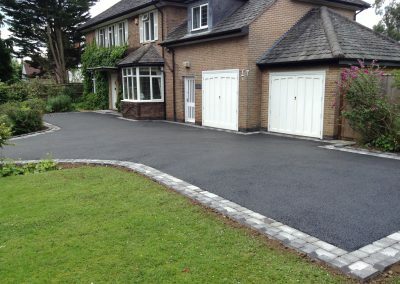 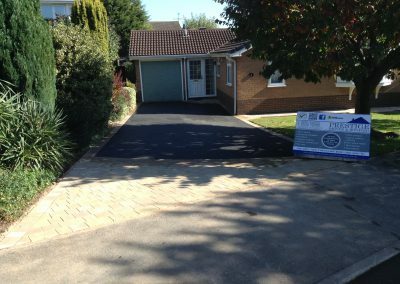 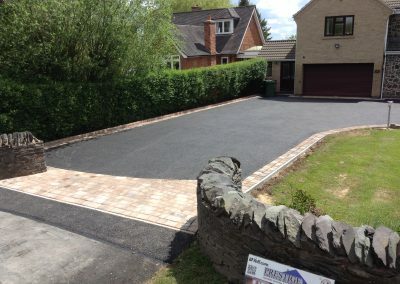 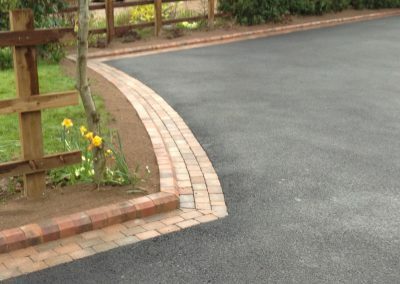 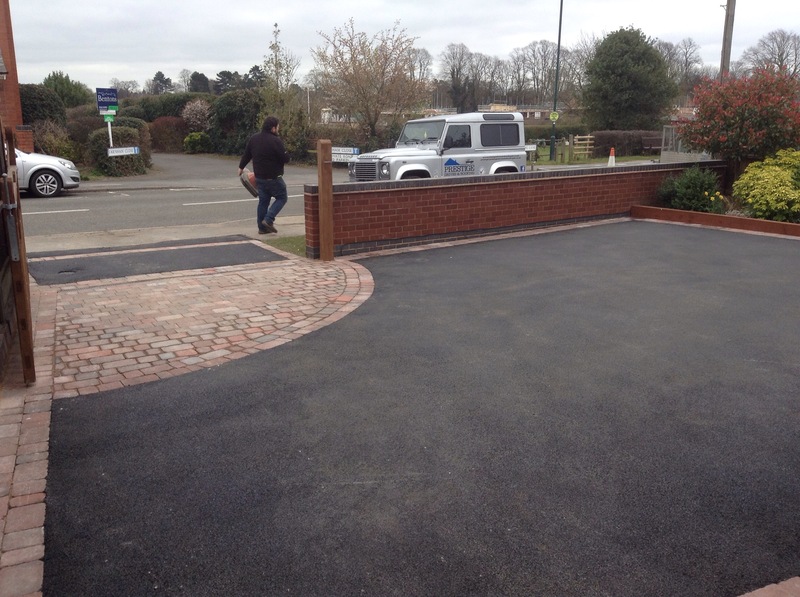 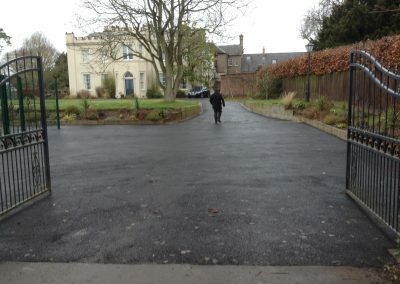 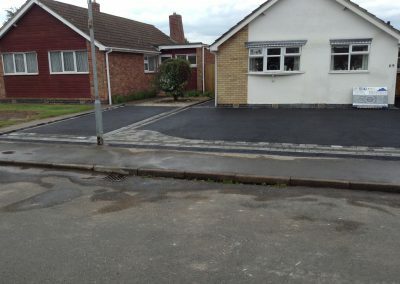 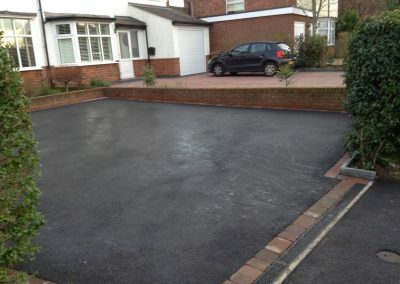 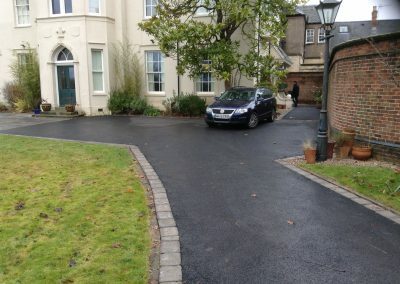 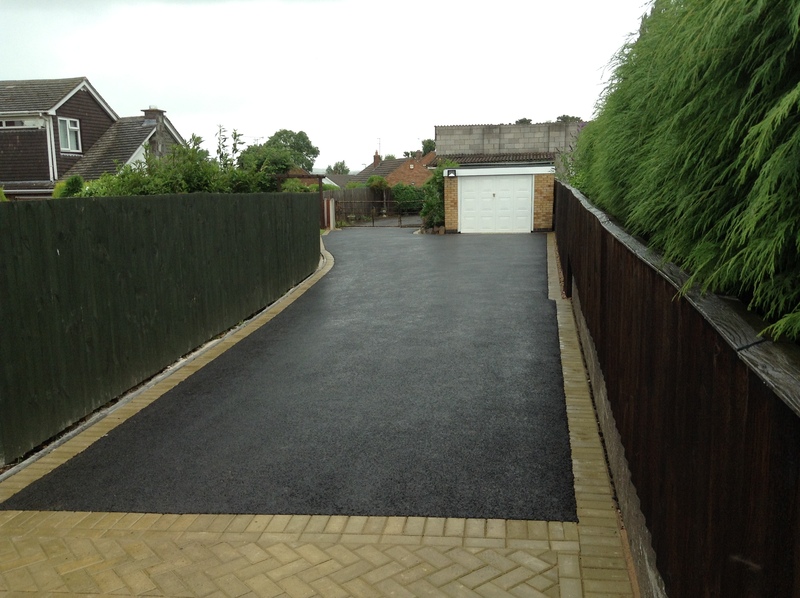 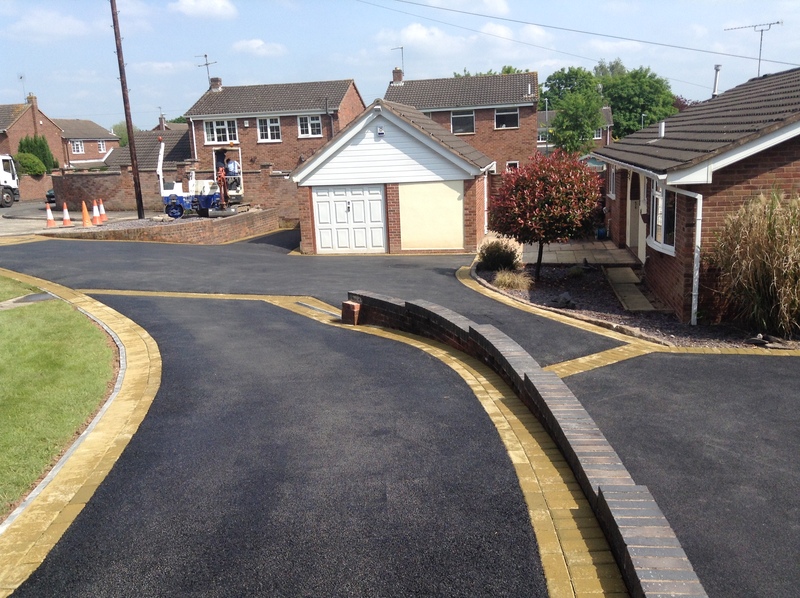 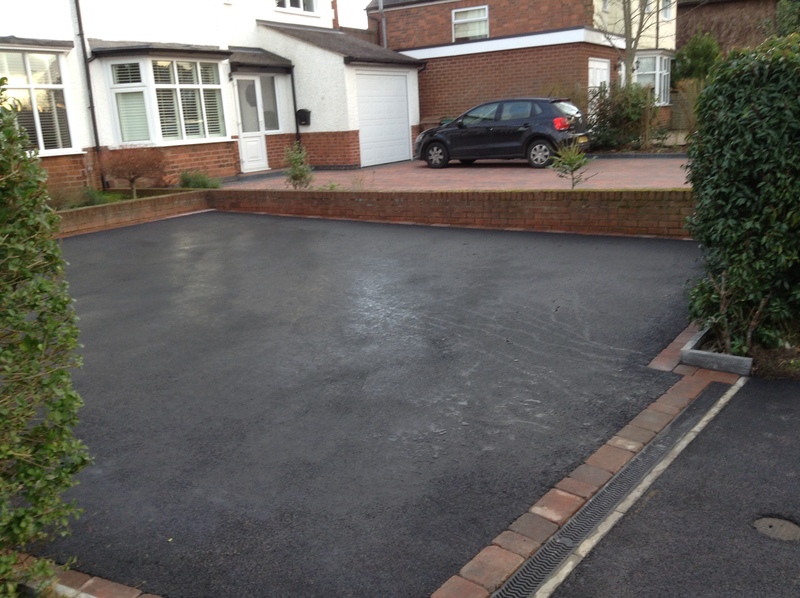 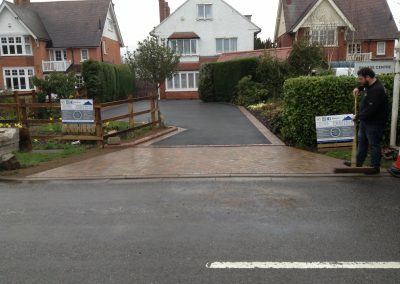 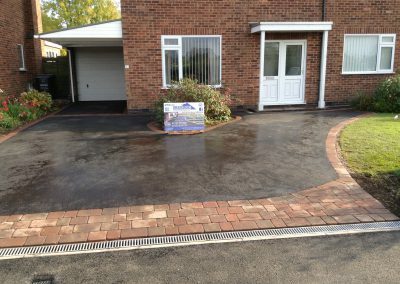 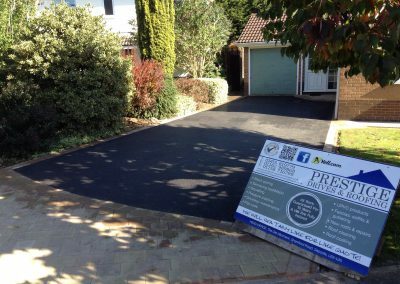 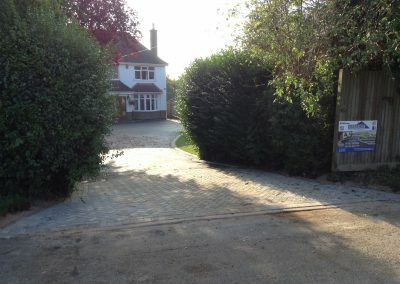 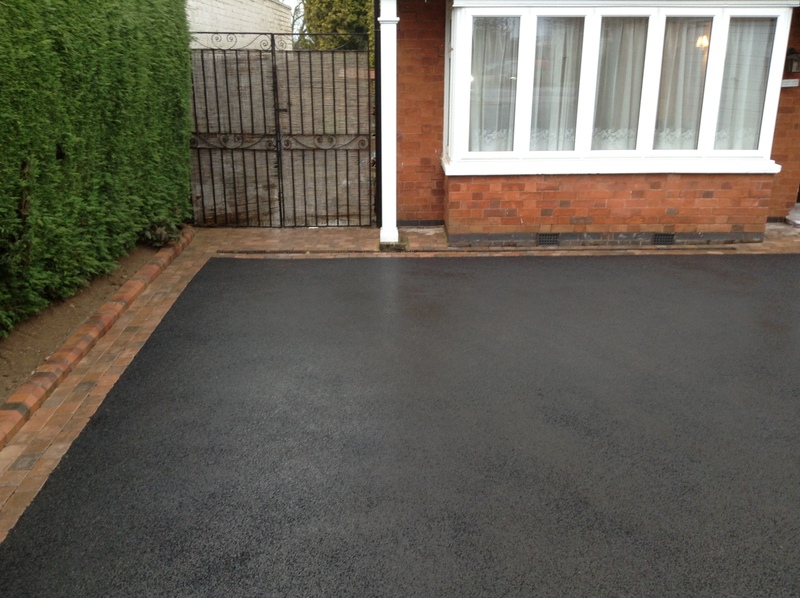 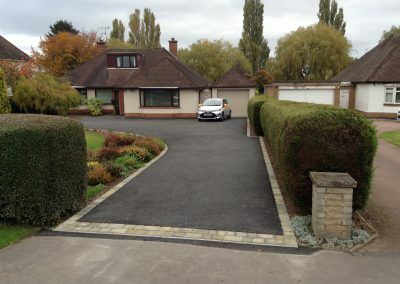 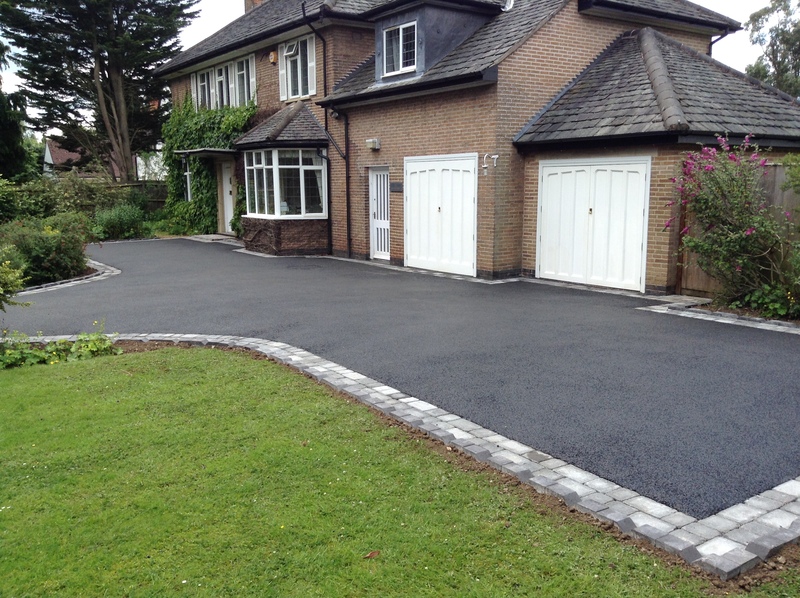 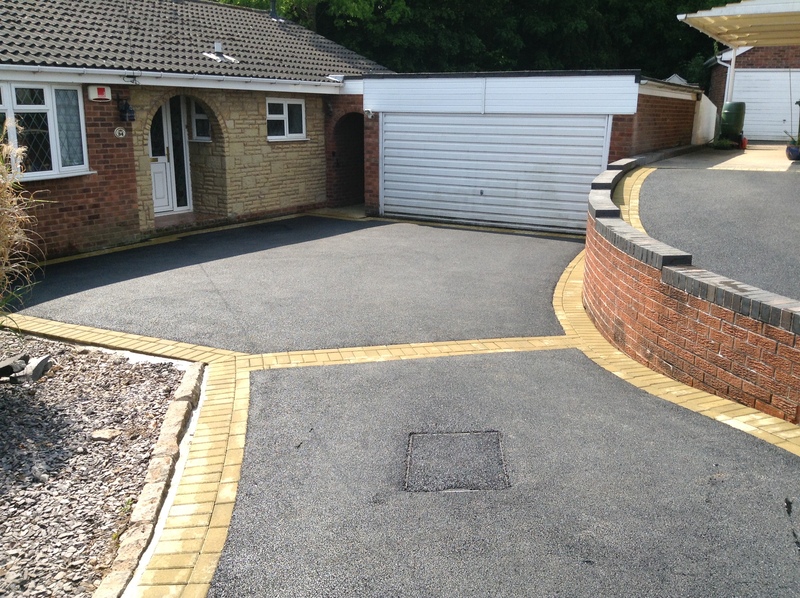 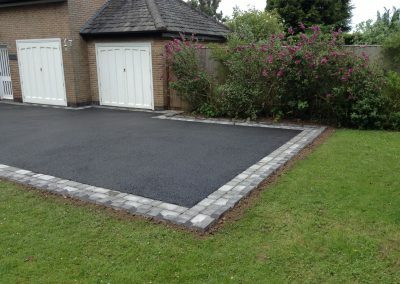 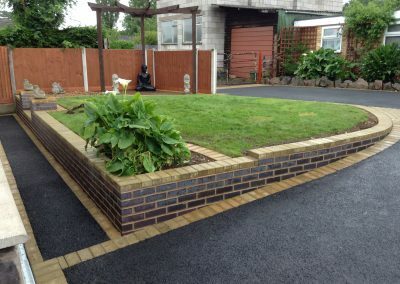 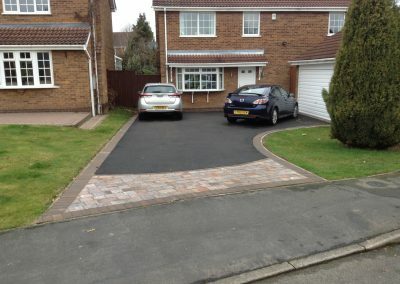 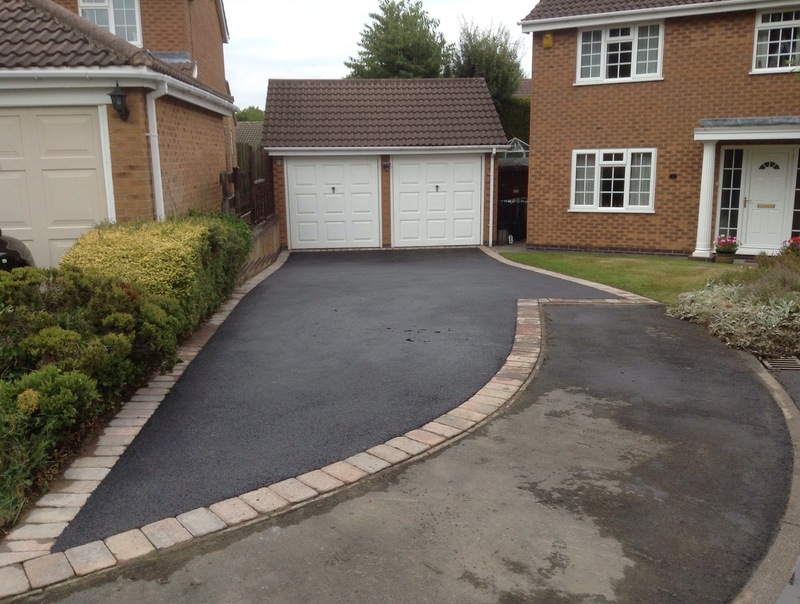 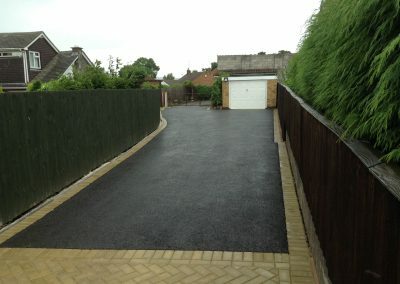 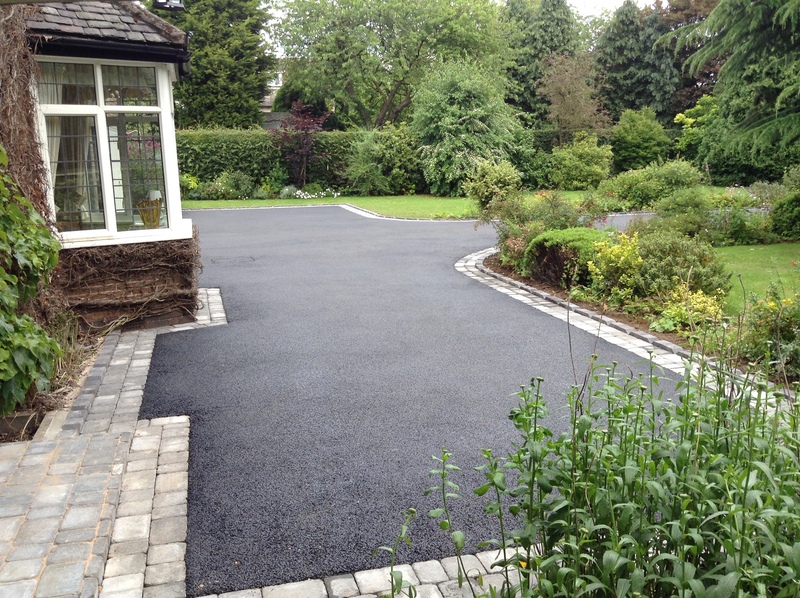 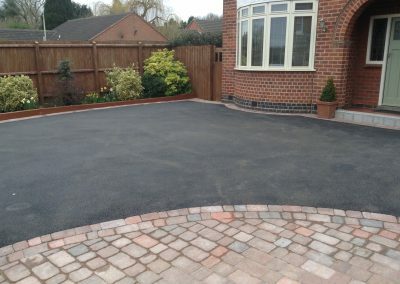 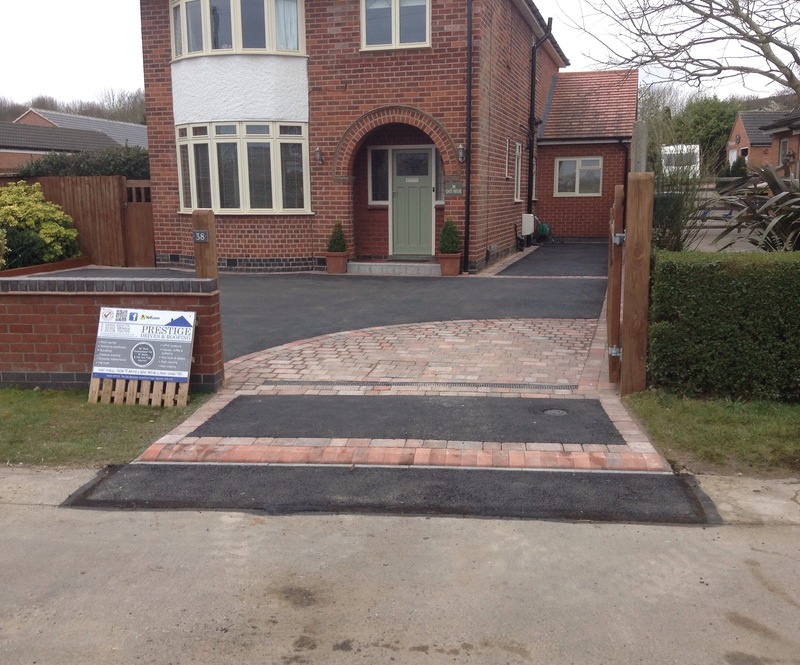 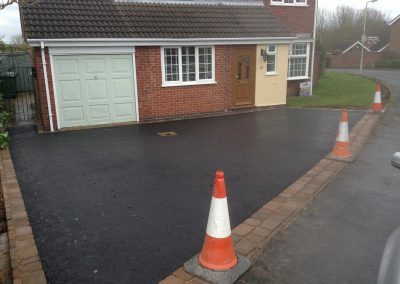 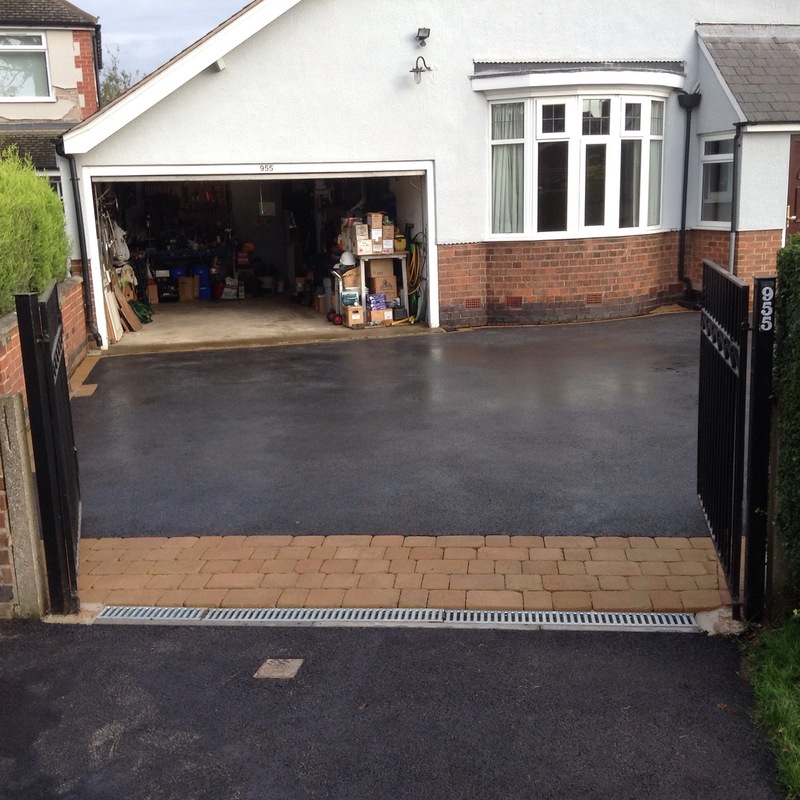 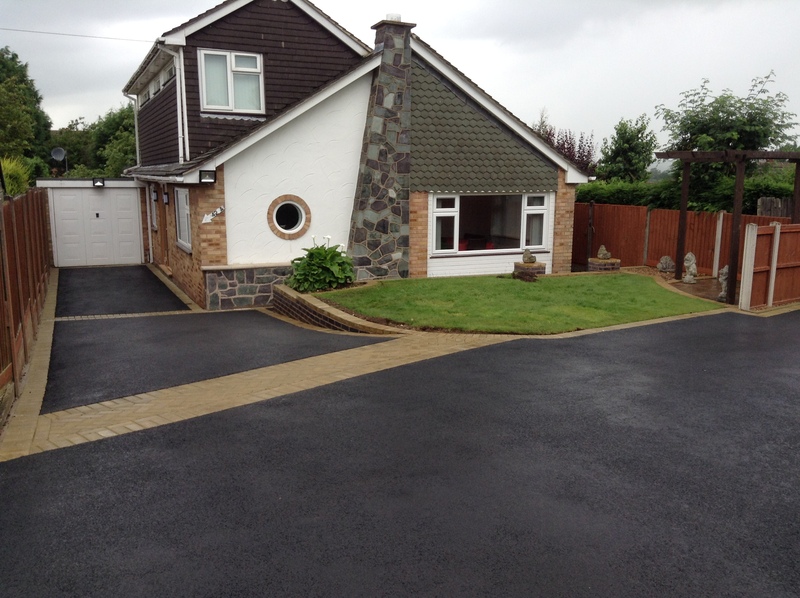 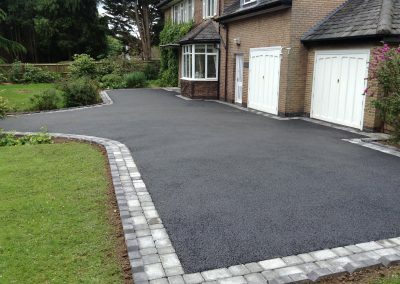 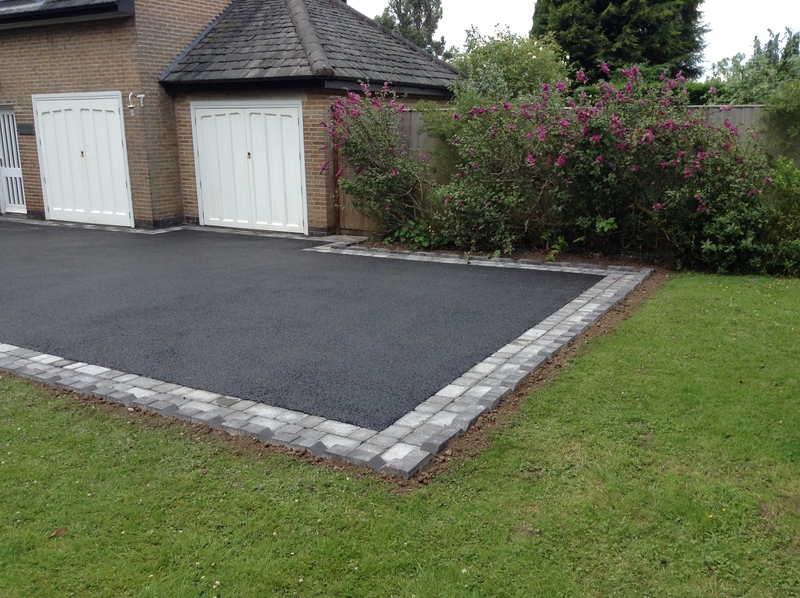 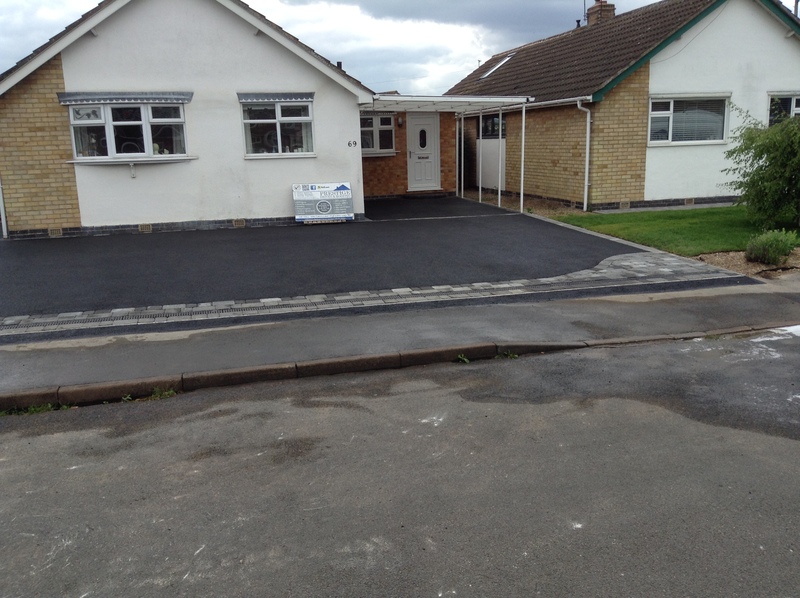 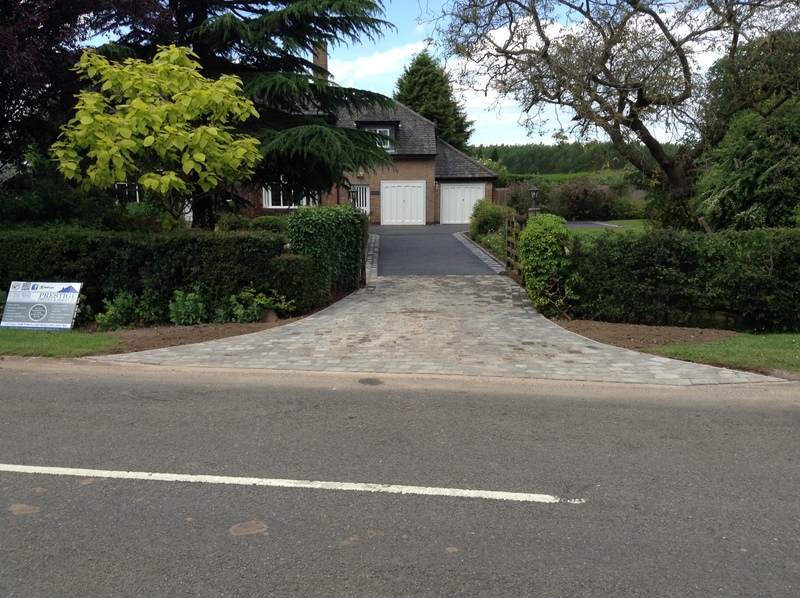 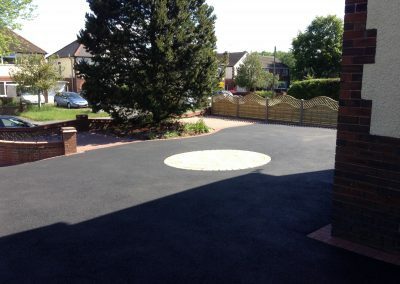 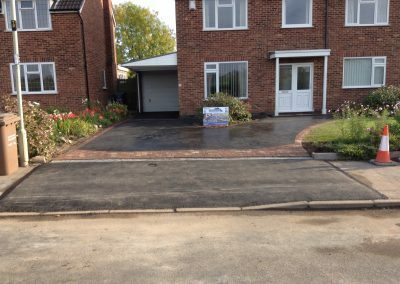 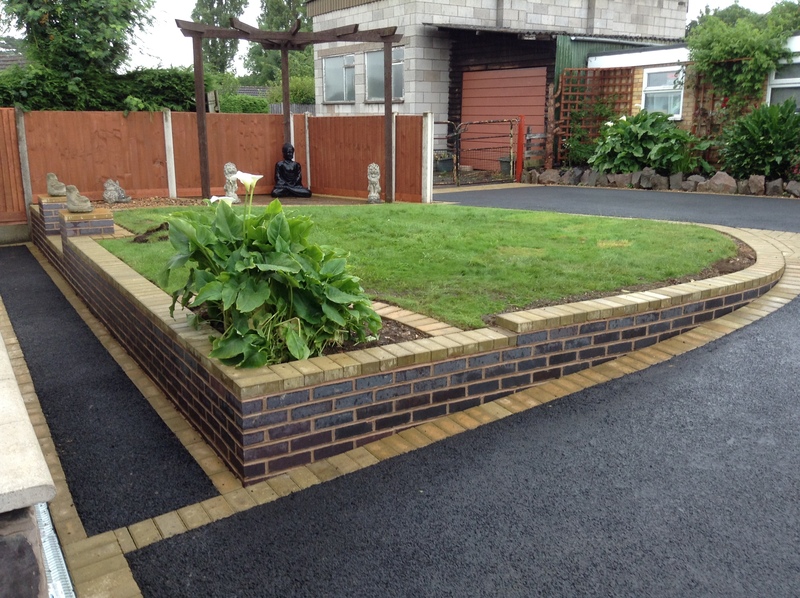 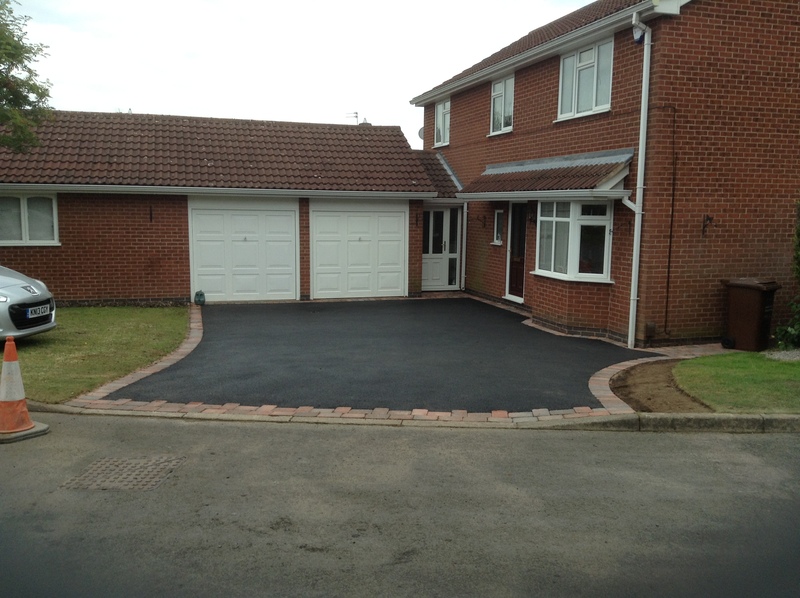 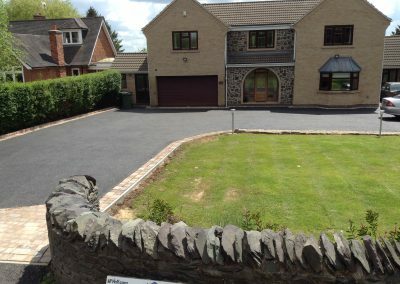 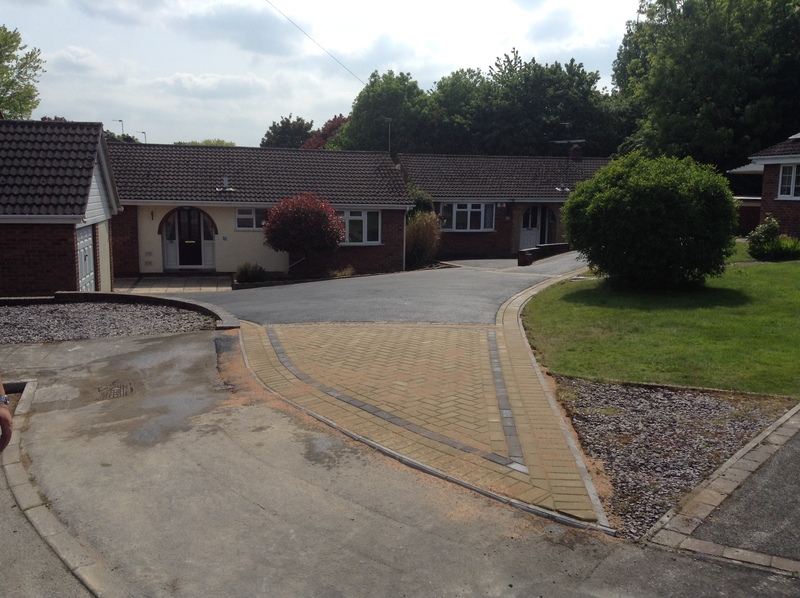 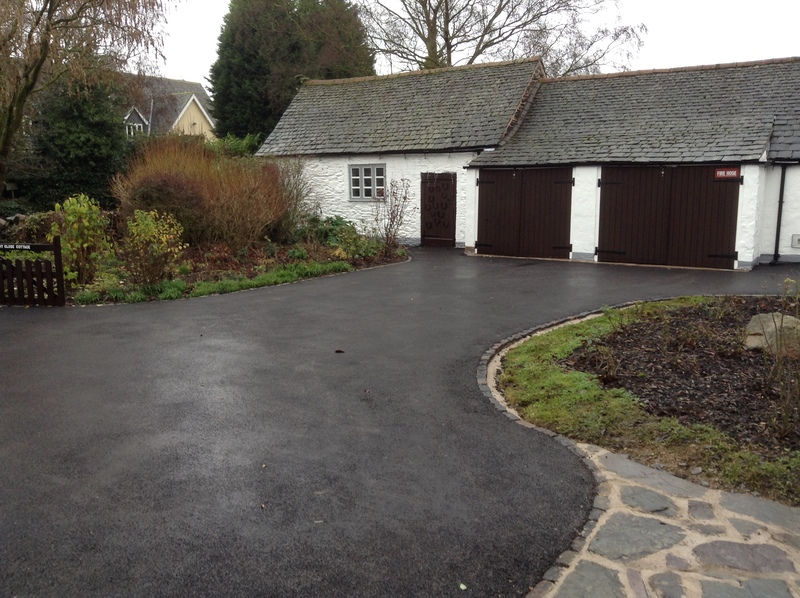 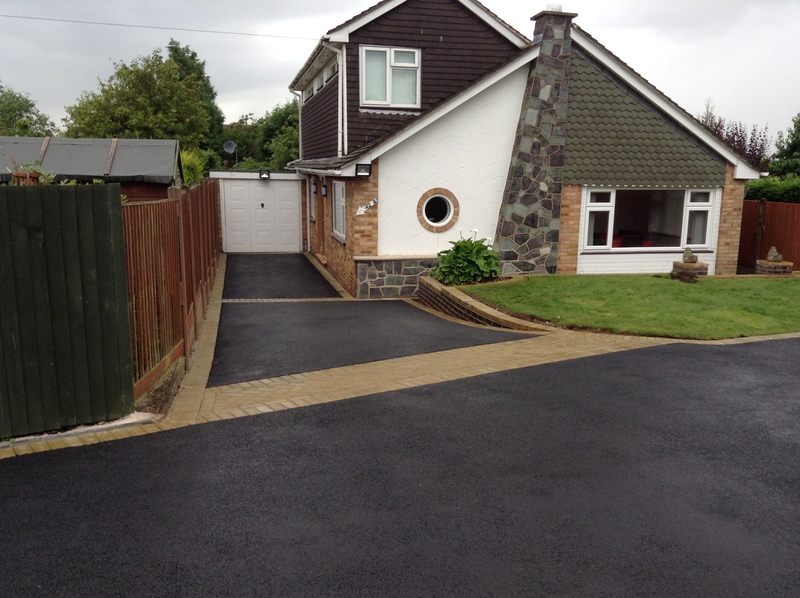 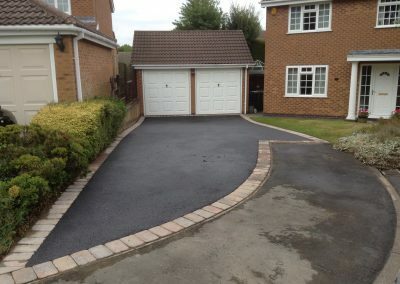 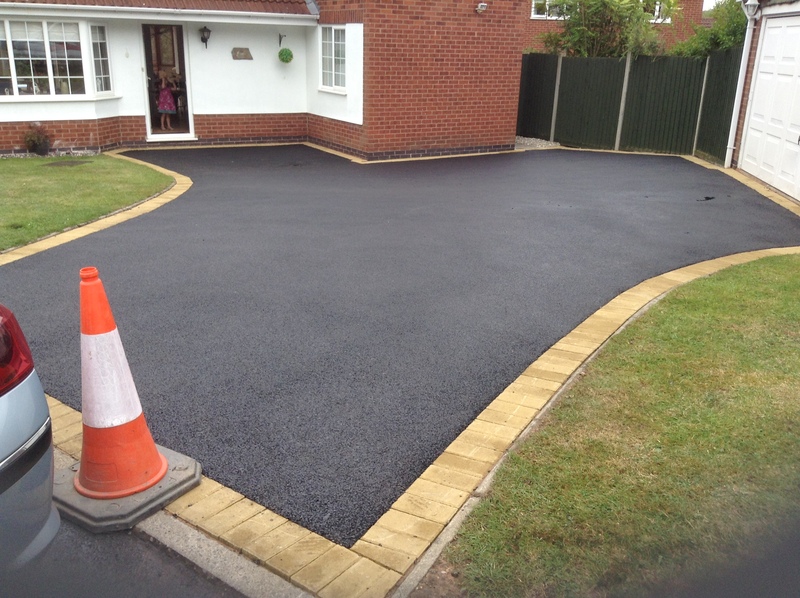 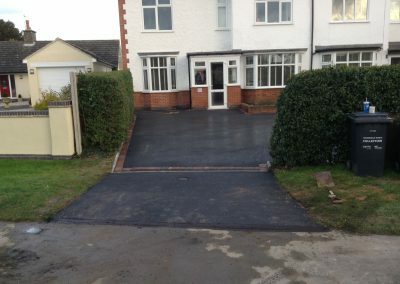 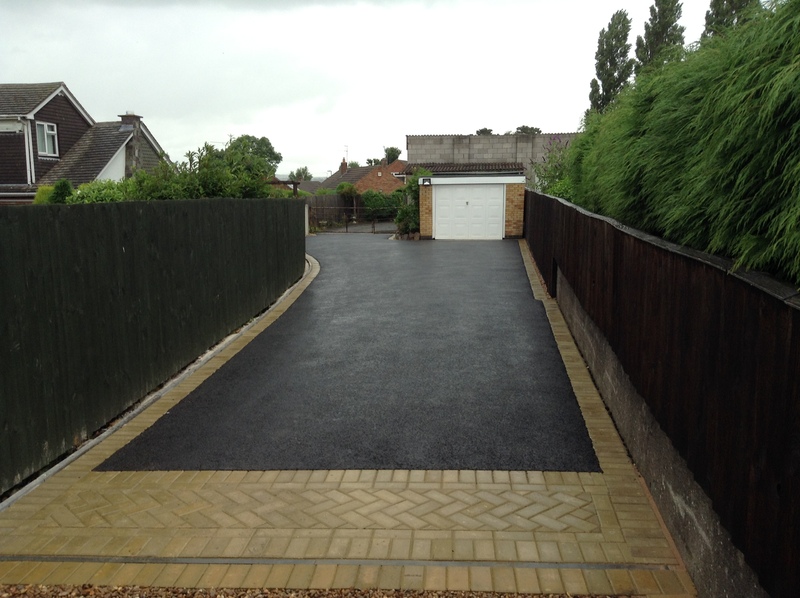 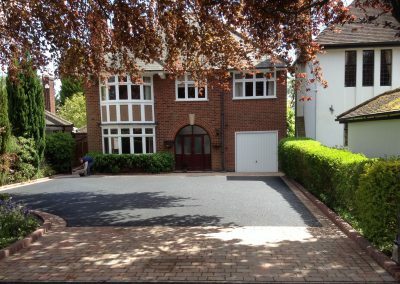 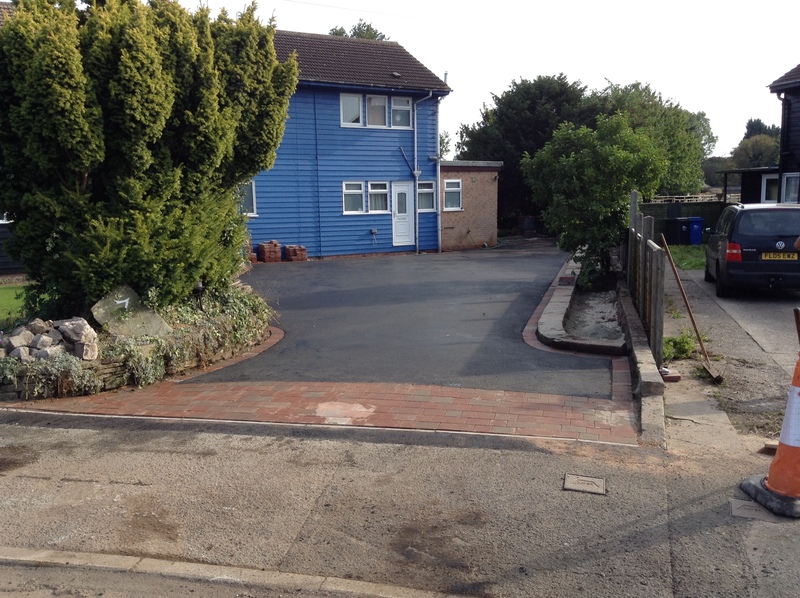 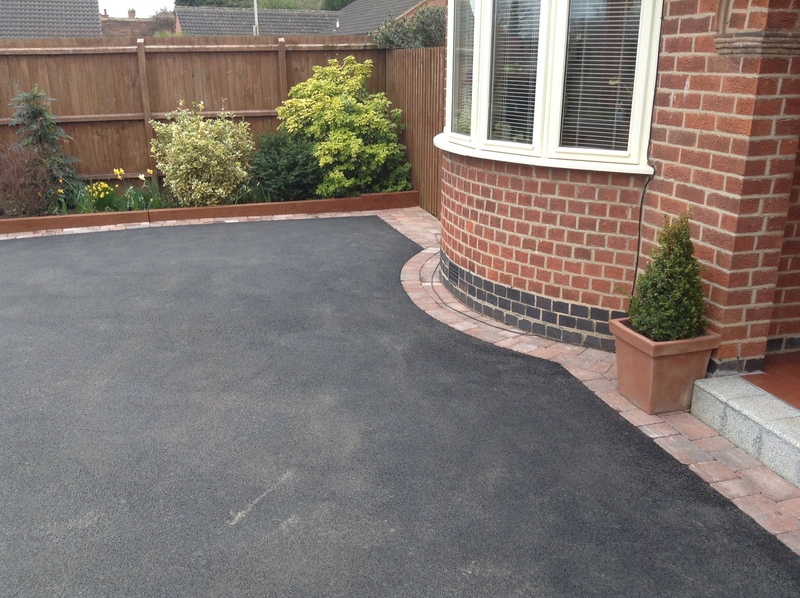 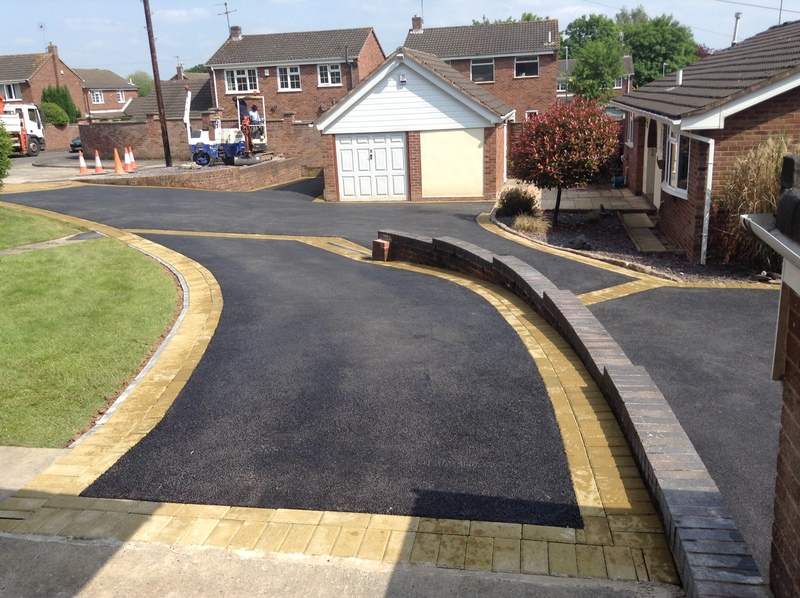 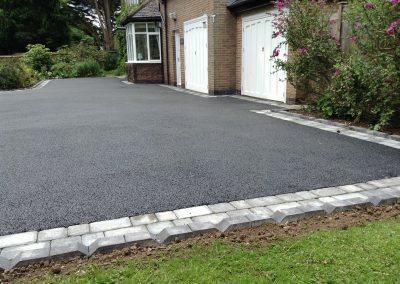 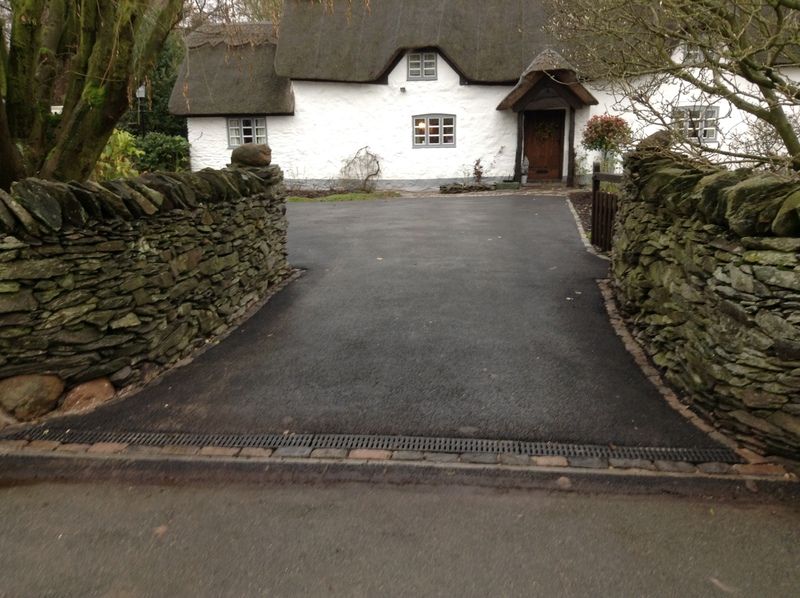 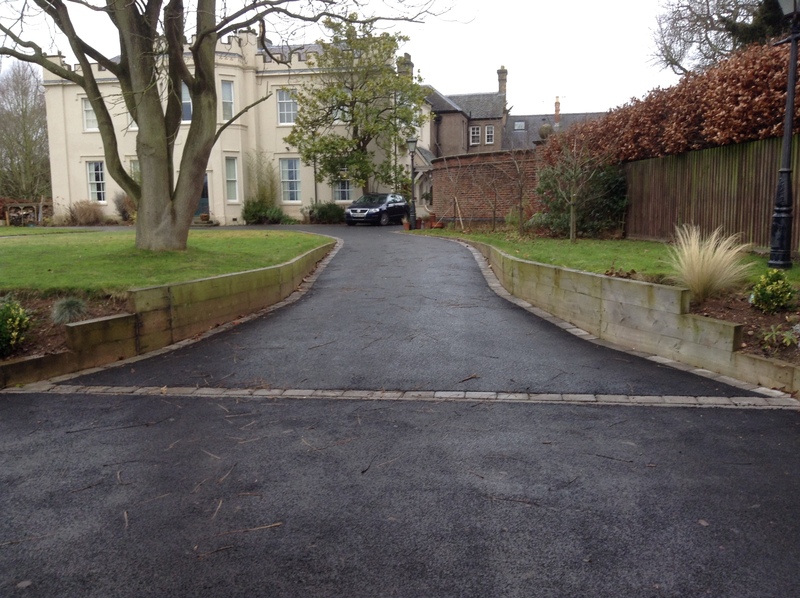 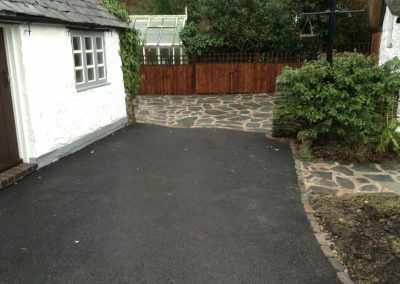 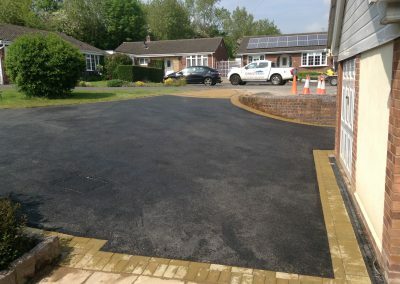 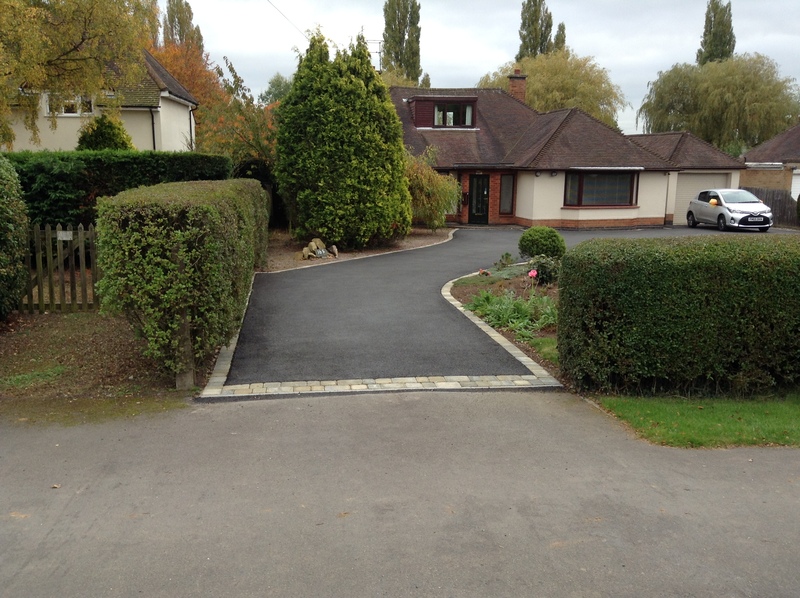 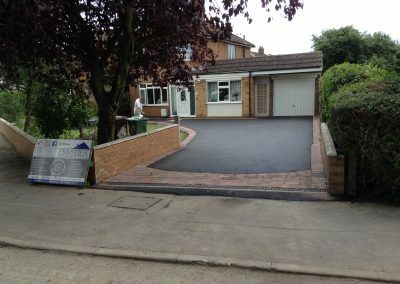 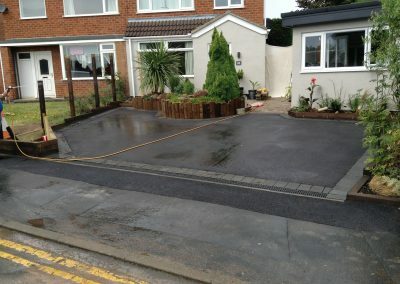 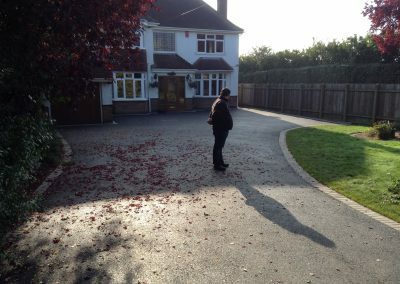 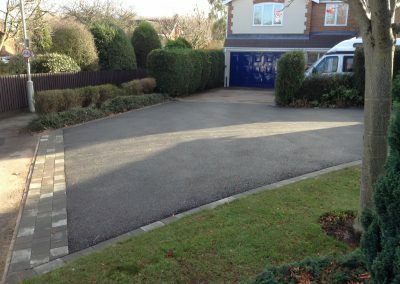 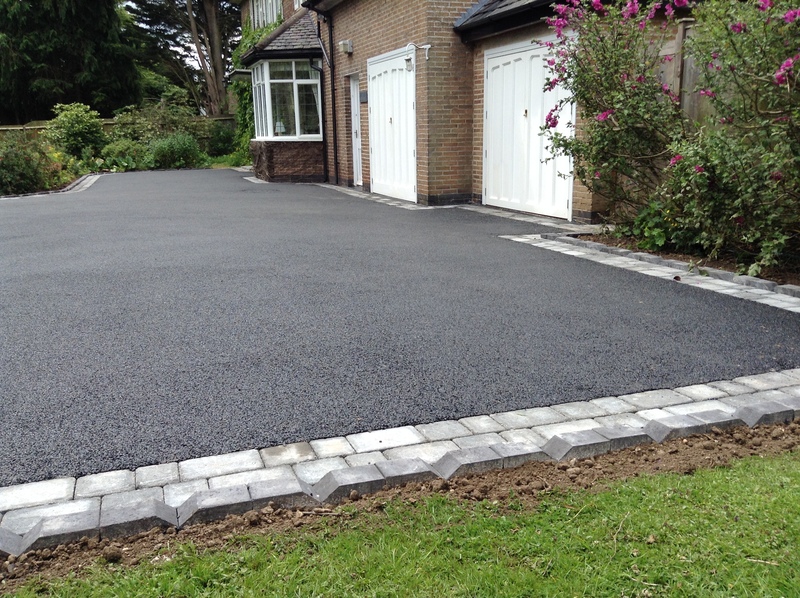 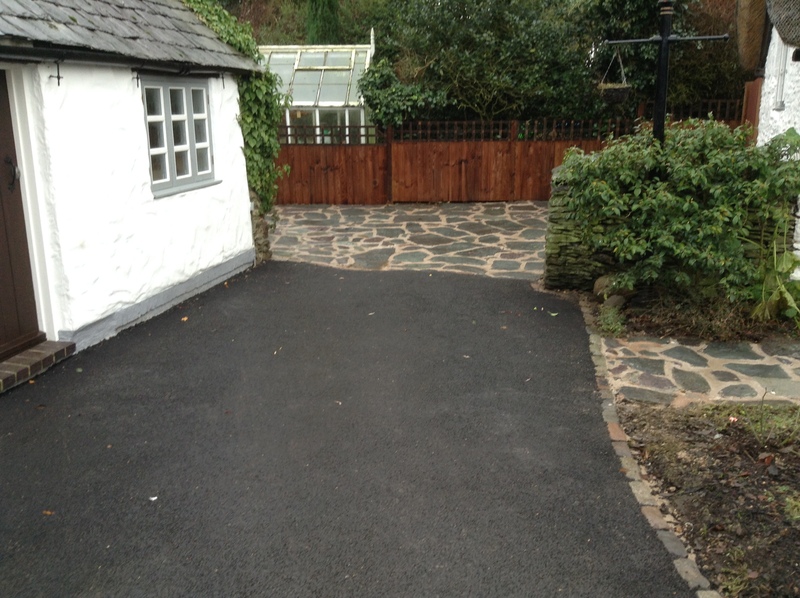 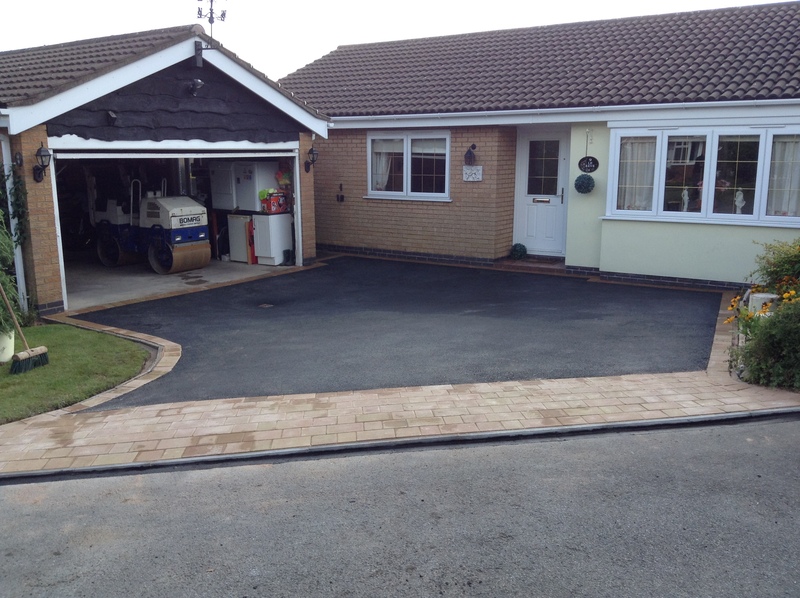 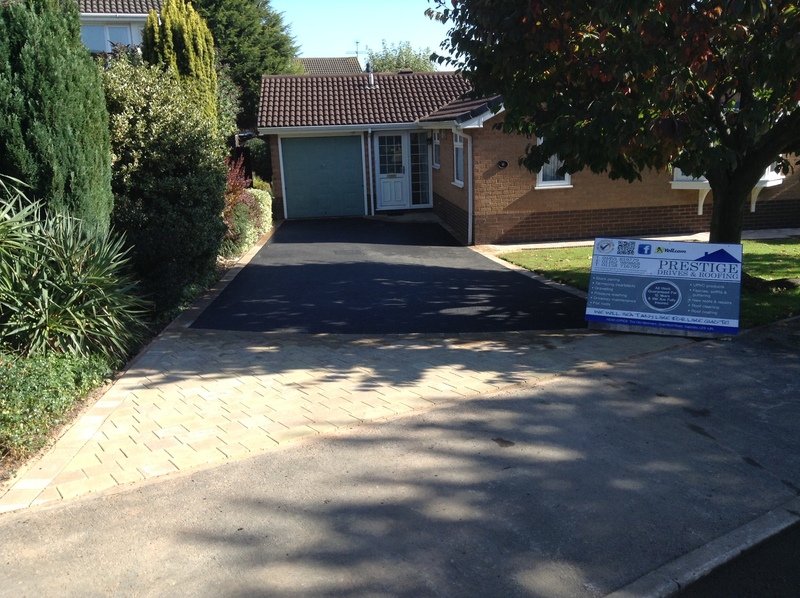 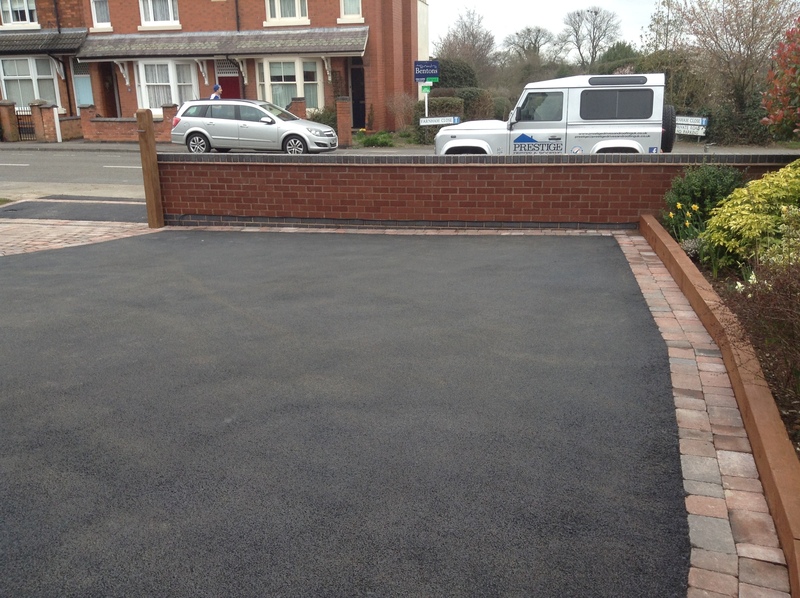 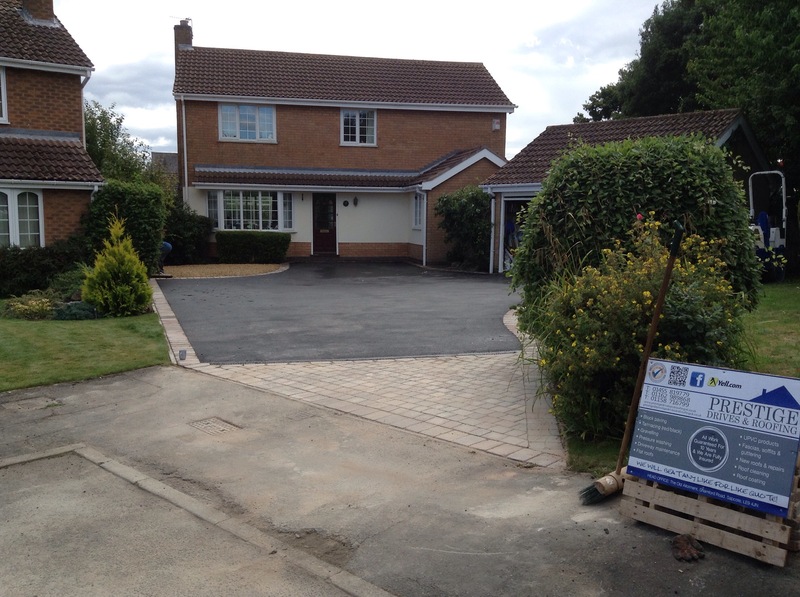 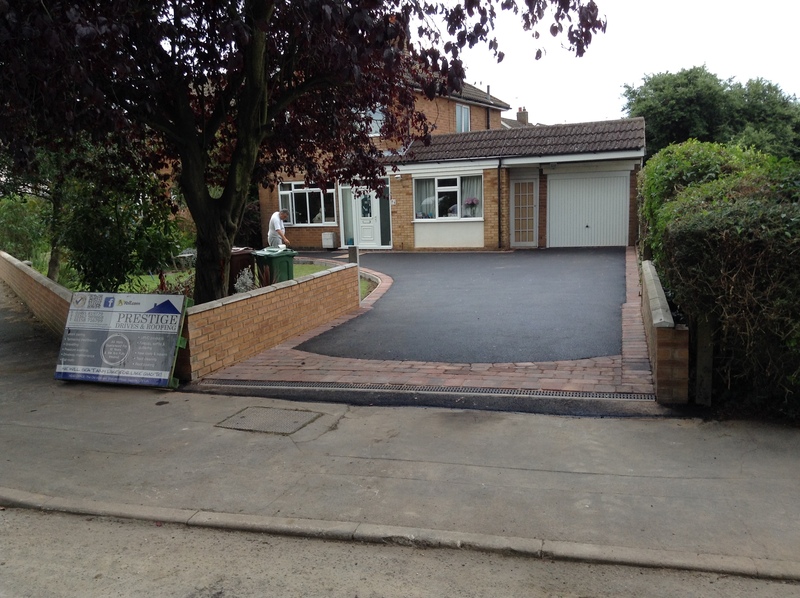 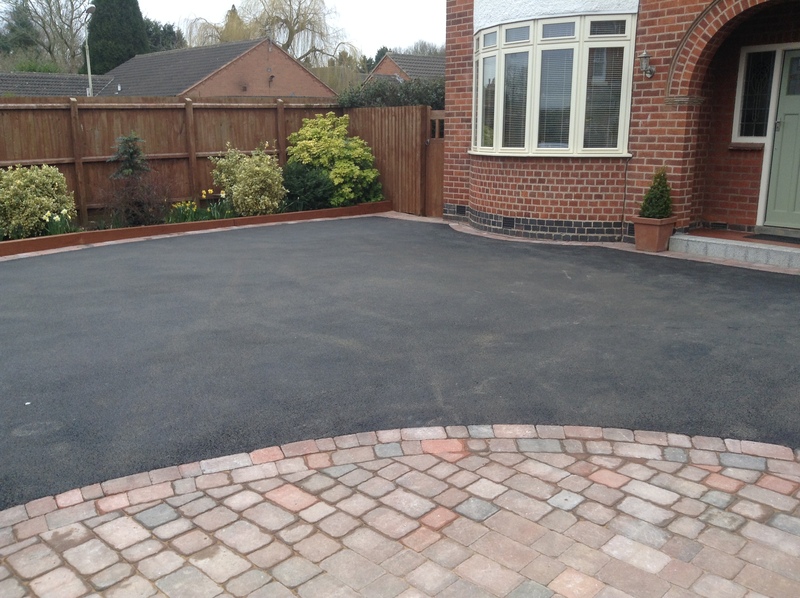 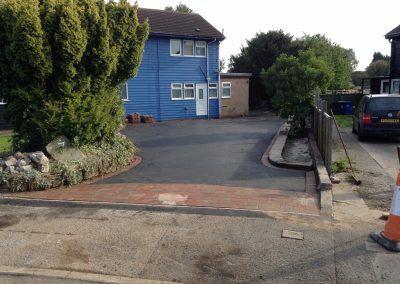 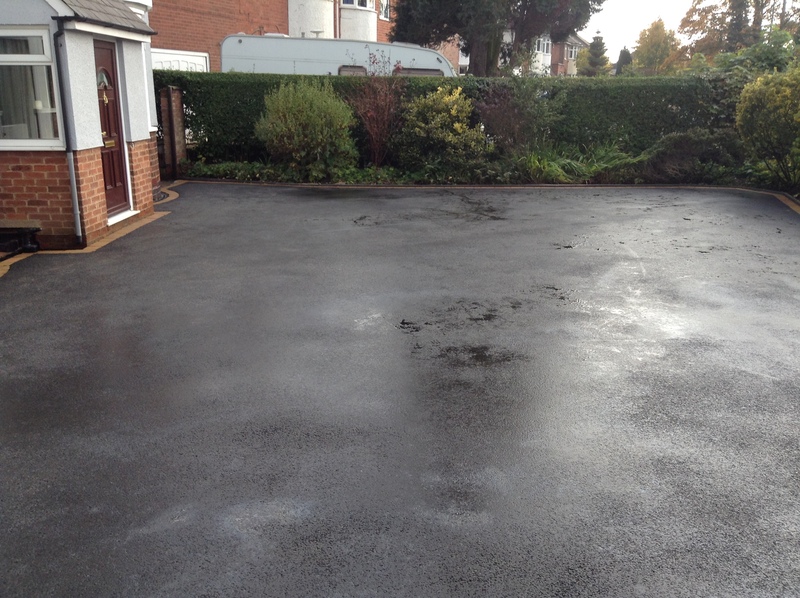 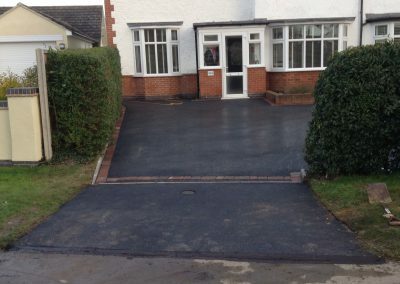 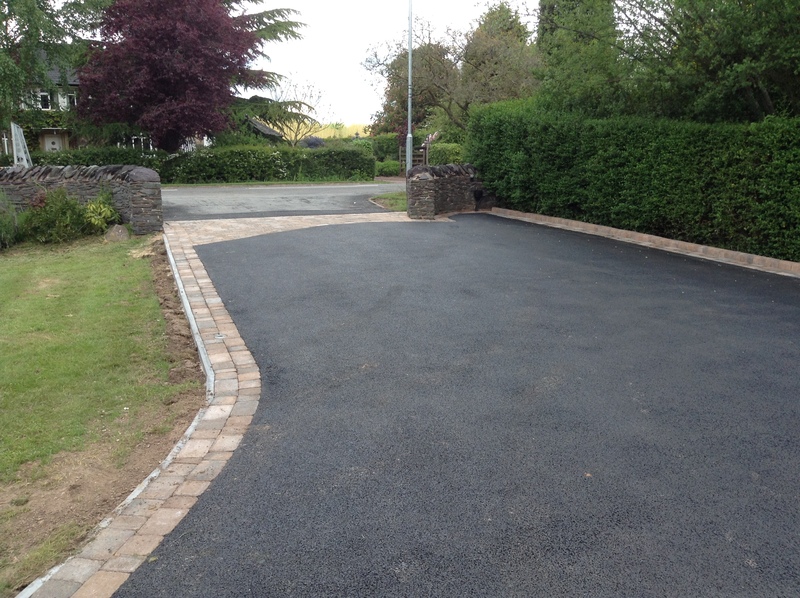 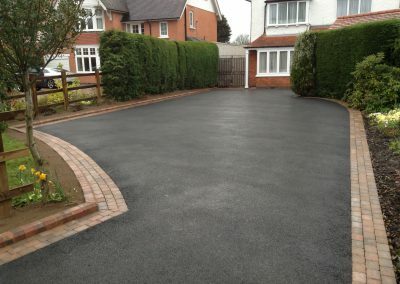 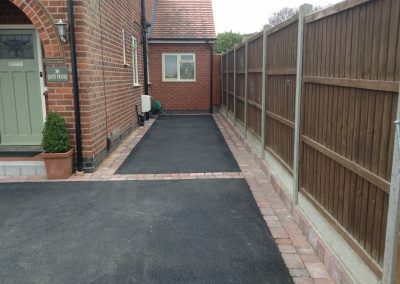 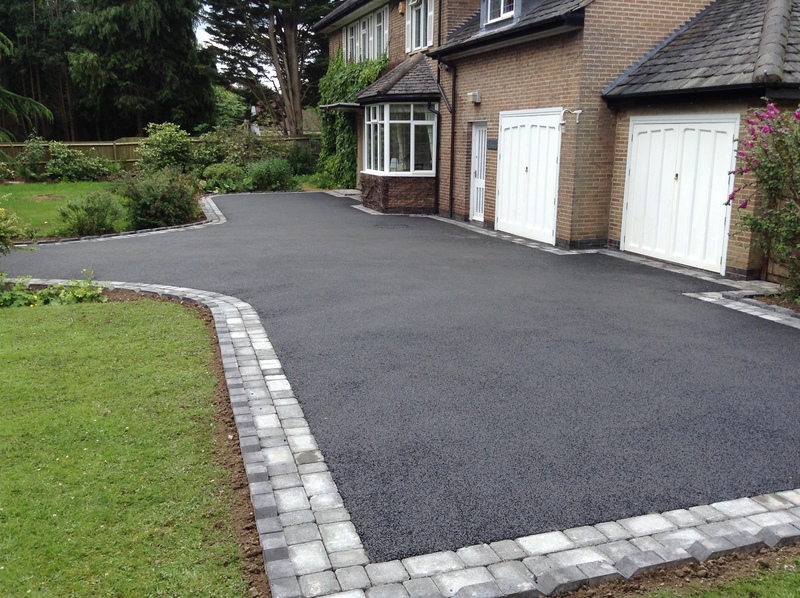 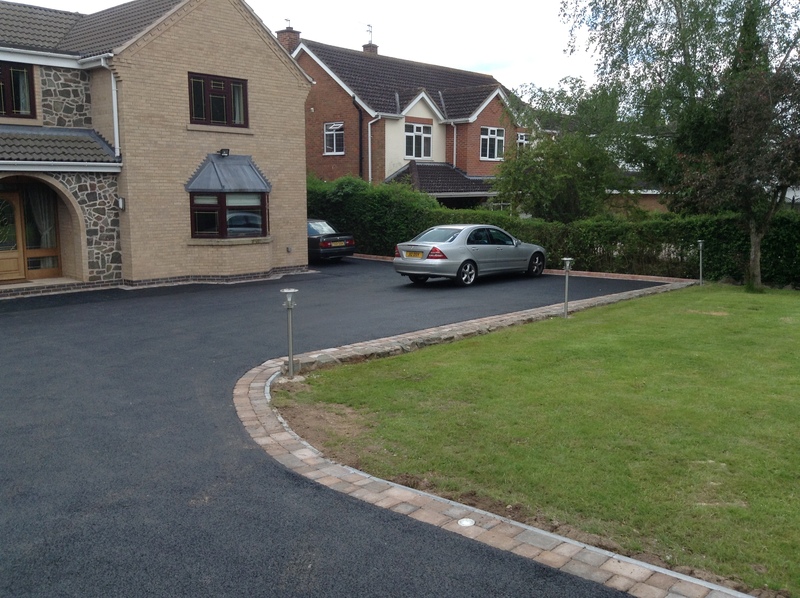 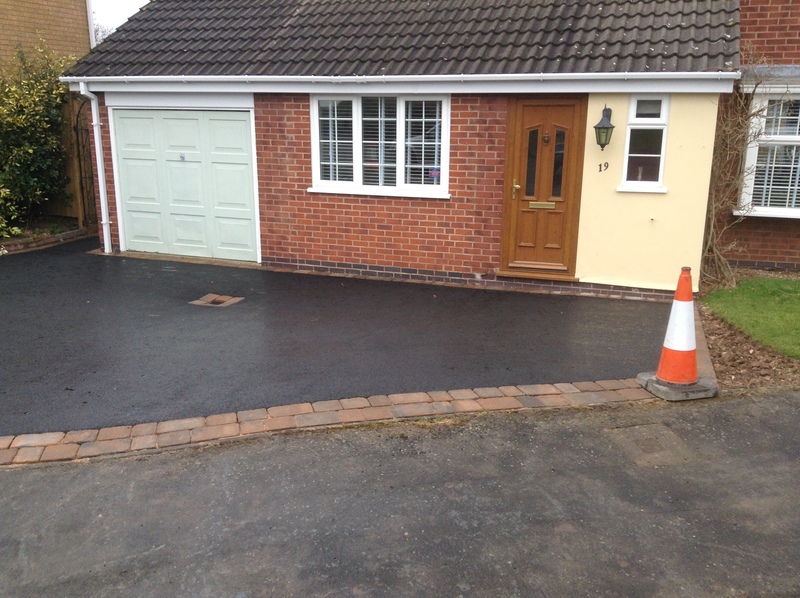 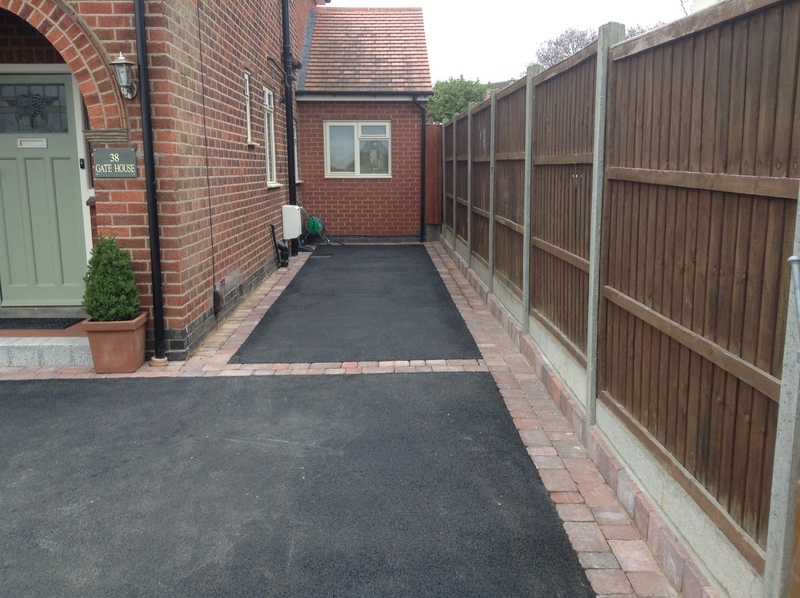 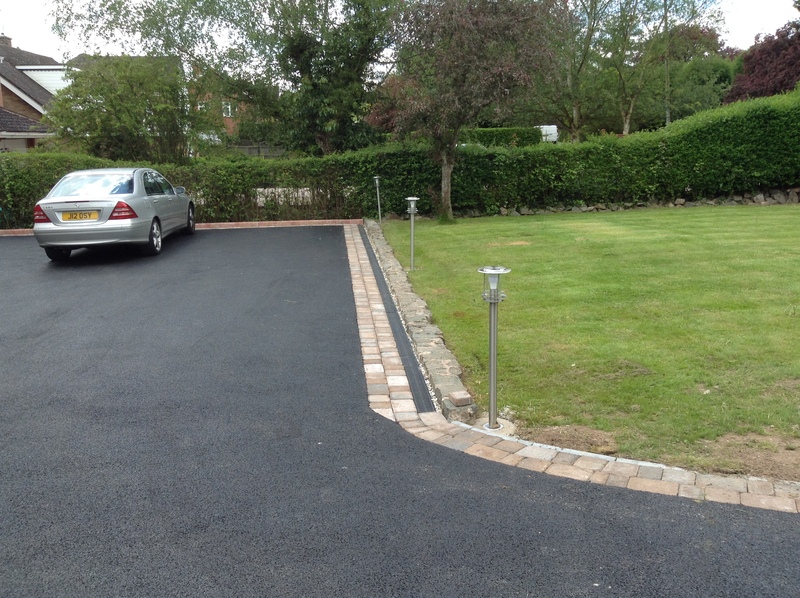 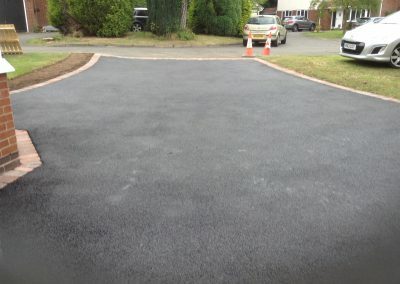 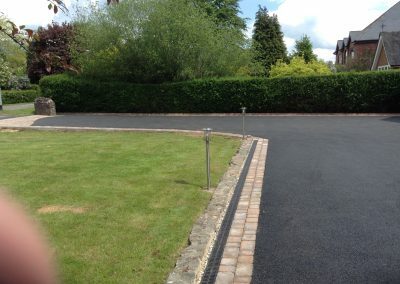 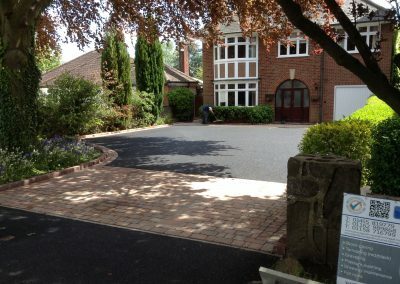 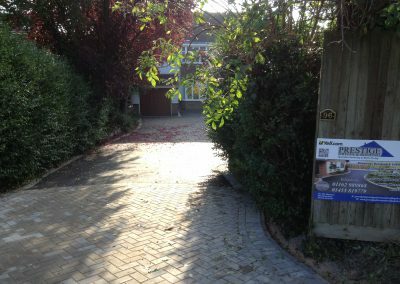 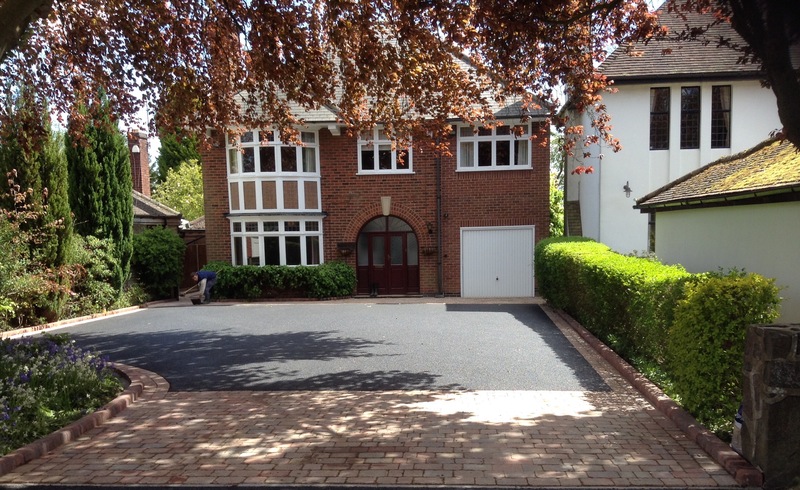 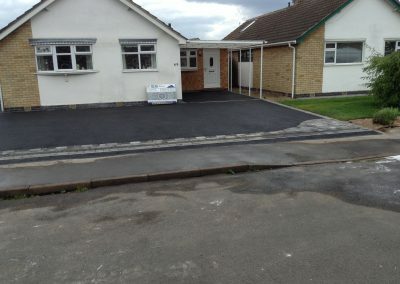 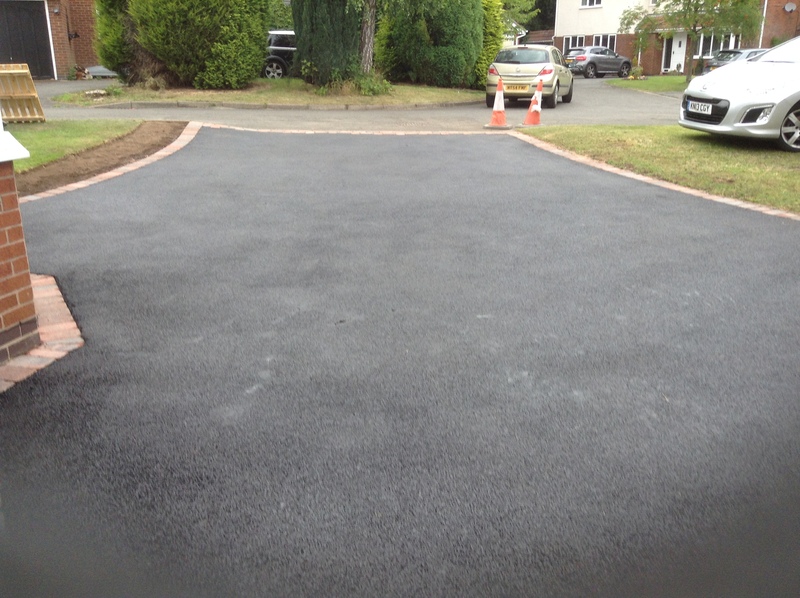 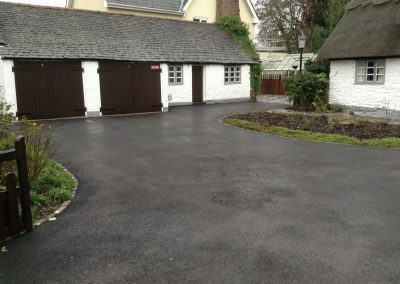 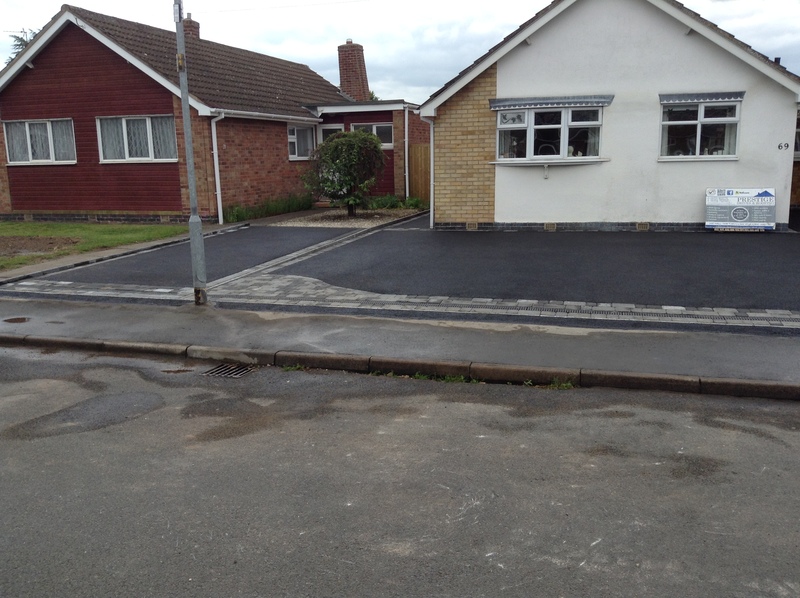 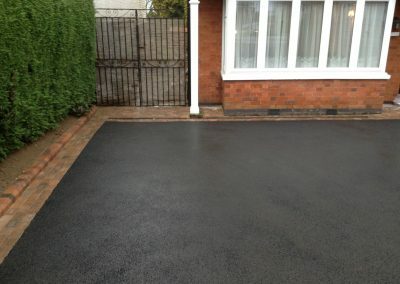 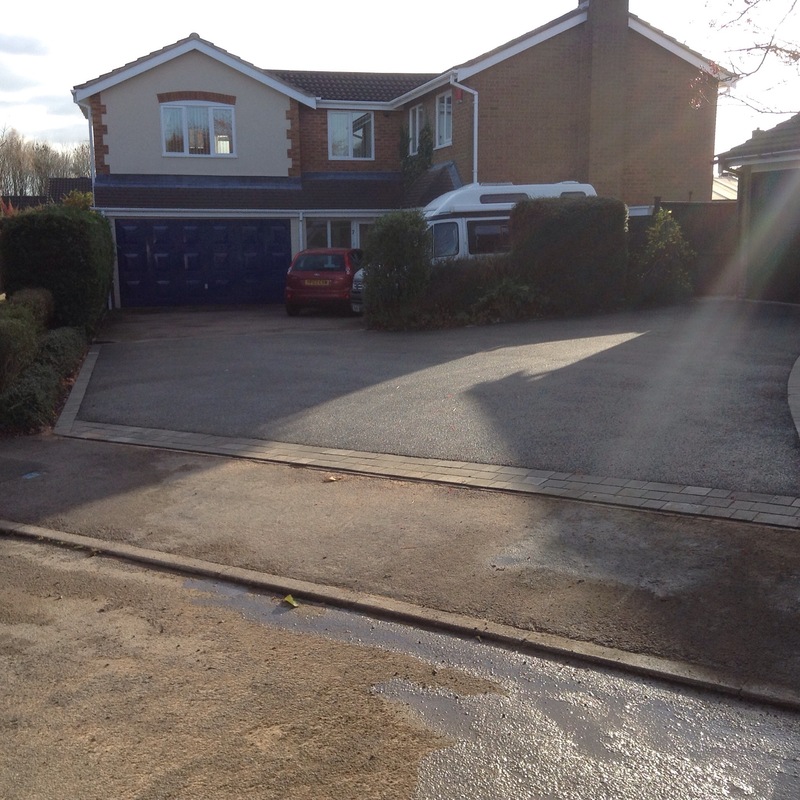 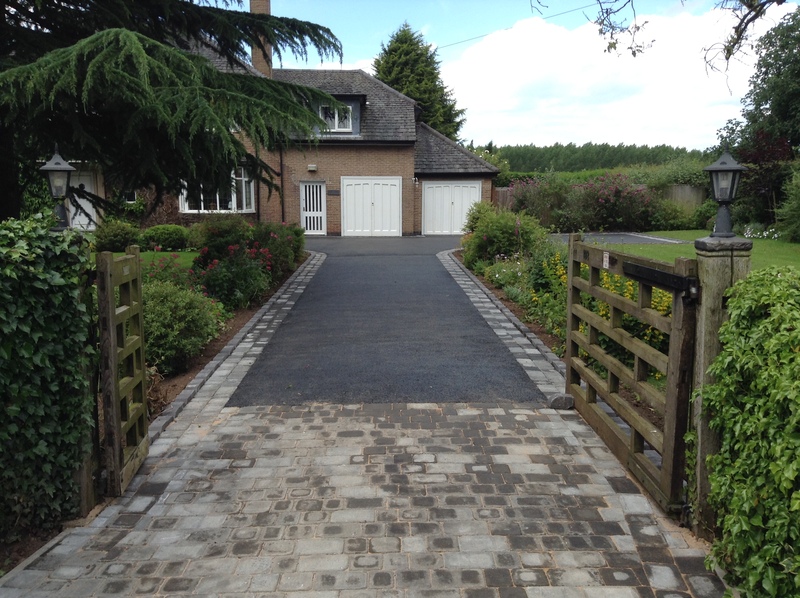 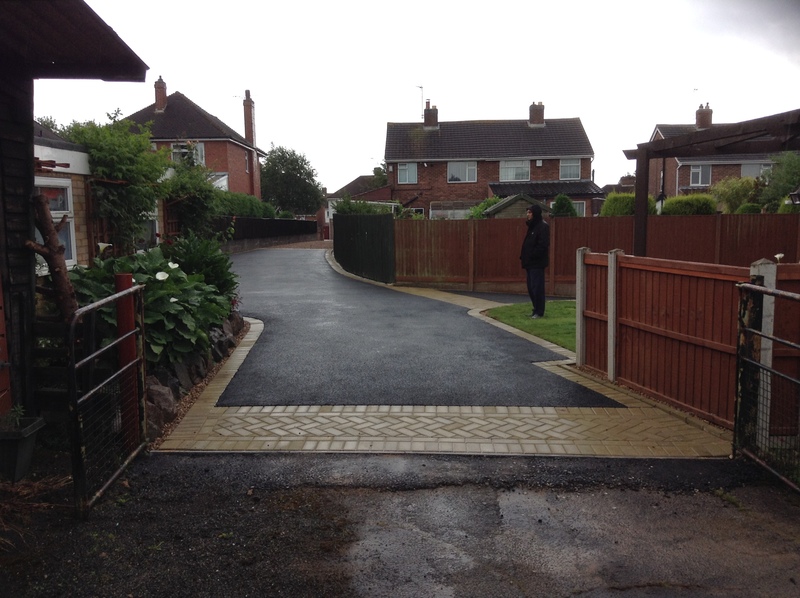 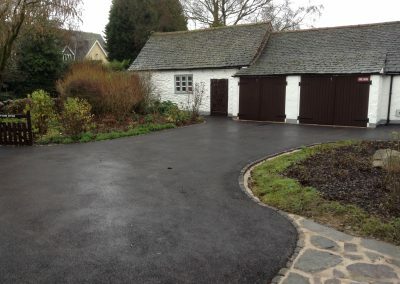 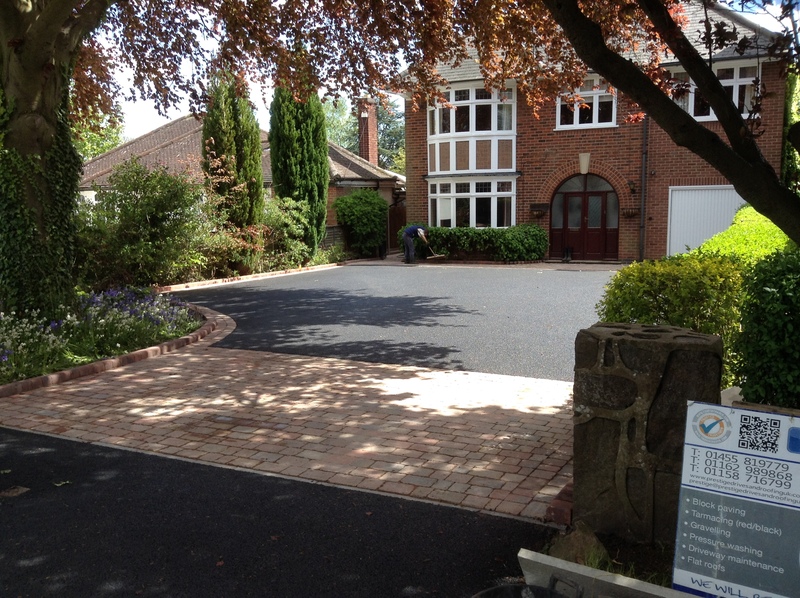 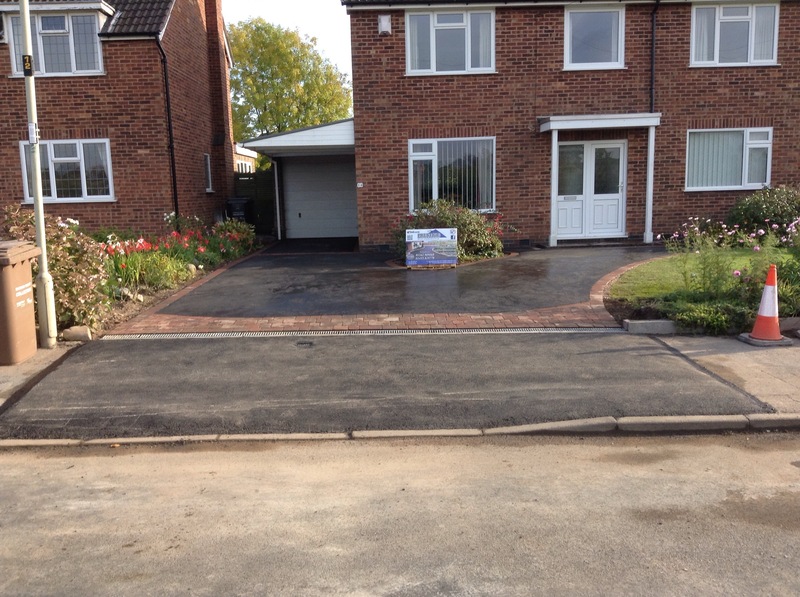 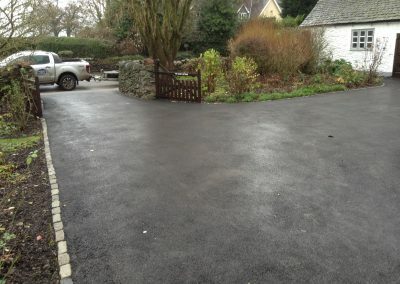 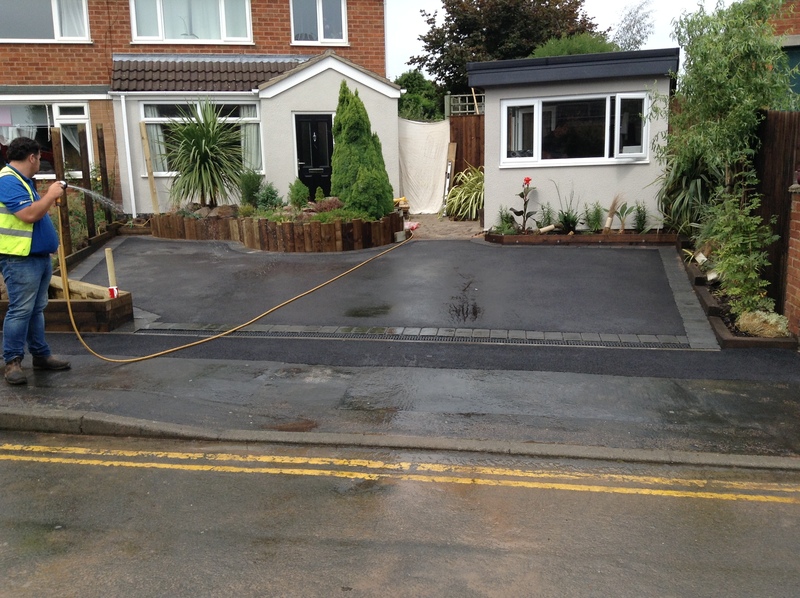 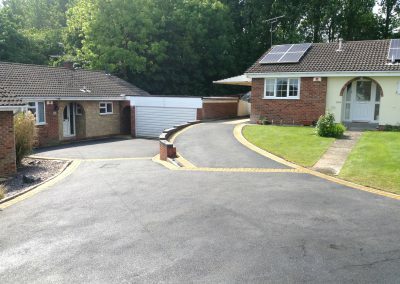 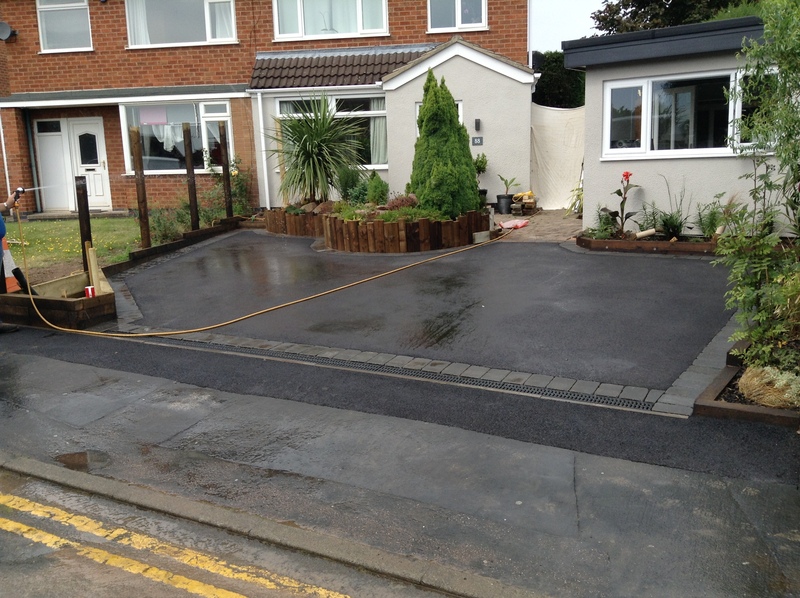 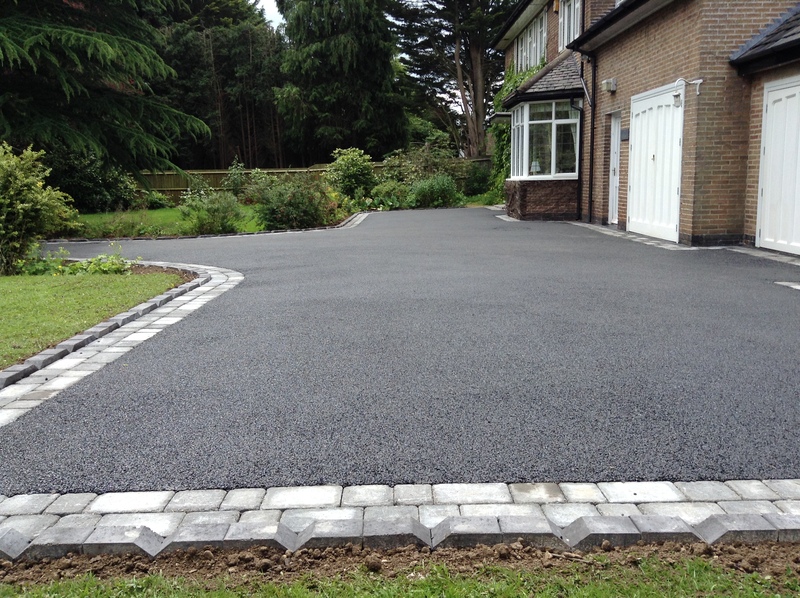 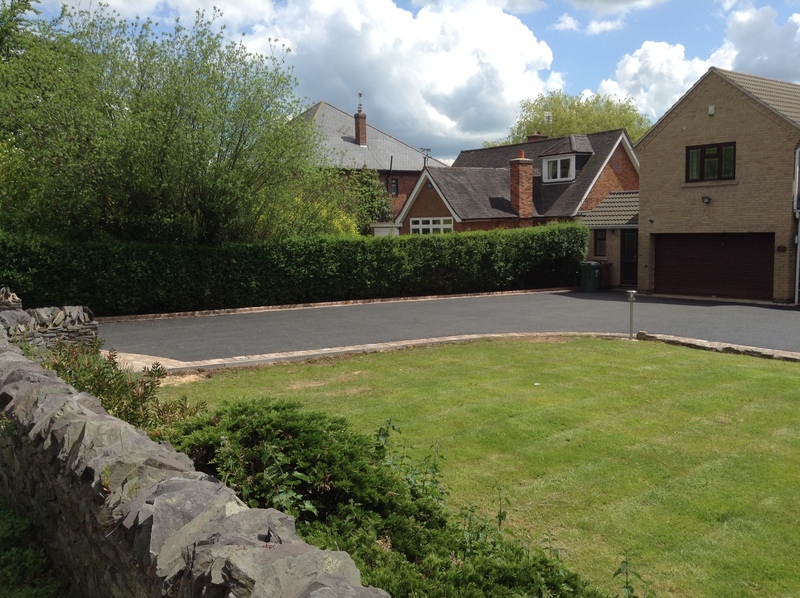 ■ A new tarmac driveway adds to your homes kerb appeal, so is useful when having your home valued or selling. 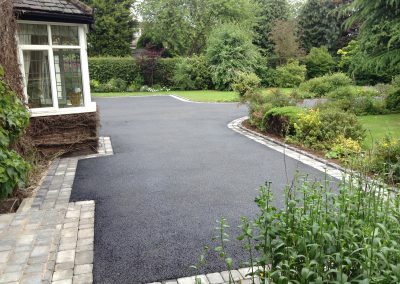 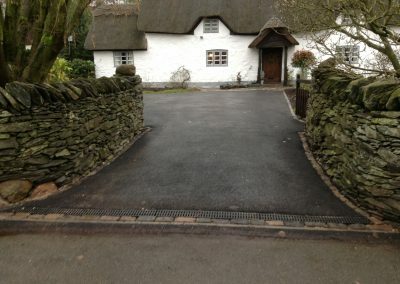 ■ In most cases it takes us just a few days to install a tarmac driveway, so it quick and easy to install. ■ Our tarmac driveways are available in either black or red. 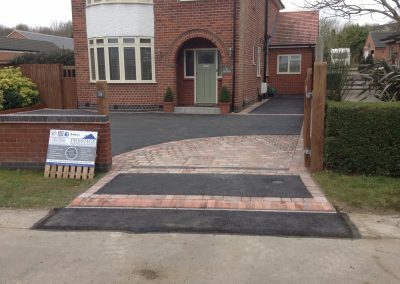 ■ Safe, durable solution. 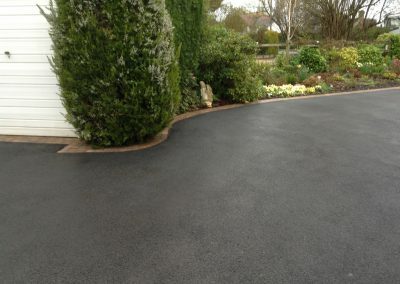 Asphalt is smooth, clean, and guaranteed maintenance-free for five years. 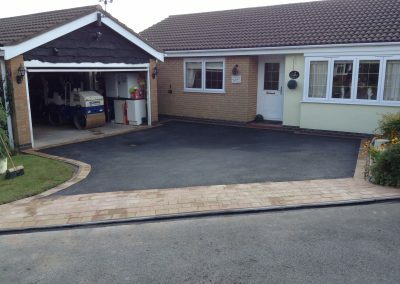 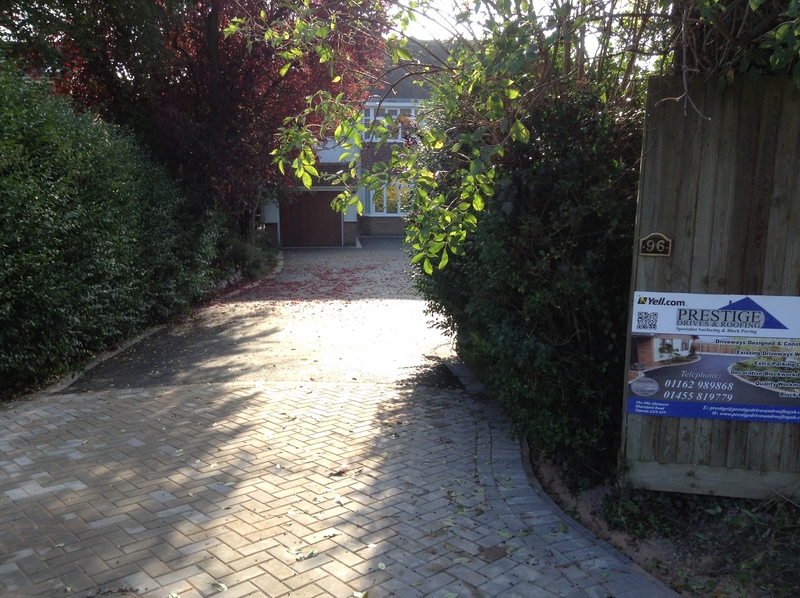 Our driveways are guaranteed for 10 years so well beyond the standard manufacturers warranty. 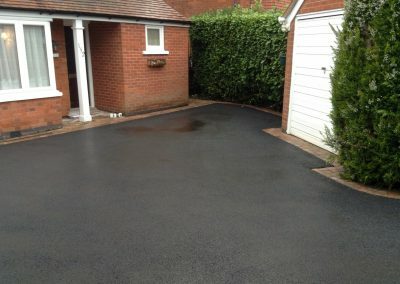 ■ Uses Bitumen, not Tar. 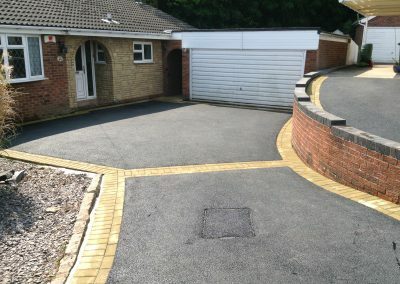 ■ It’s clean and does not breakdown easily. This reduces the risk of little bits of grit getting stuck in your trainers or boots and then being trodden into carpets.